Last week there were roughly twenty nearly ripe tomatoes in the tub. This week there’s over fifty. Only a couple feel ready to eat, and I’m not quite ready to make more sauce, so we’ll look in again next week. Last week there were seven or eight nearly ripe tomatoes in the tub. Those went into last week’s tomato sauce. Here’s the status this week: roughly twenty tomatoes of various makes and models, starting to ripen. None are quite ready to eat, and I’m not quite ready to make more sauce, so we’ll look in again next week. Note also that the bigger of the two Knucklehead pumpkins has already turned orange. We’ll probably let all the squash go until November sometime. 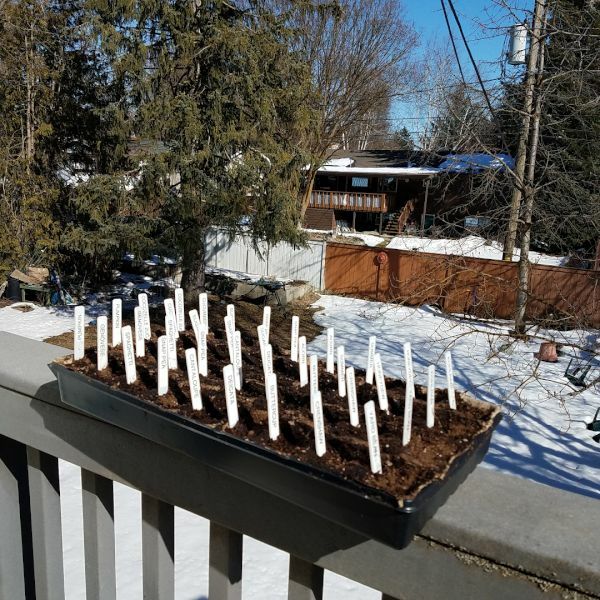 Well, OK, it really began two weeks ago when I scattered some lettuce seeds in Section 1, but the NENW has had an unusually cold and wet winter/spring (current soil temperature is 50F), so our formal planting is starting off about a month later than I hoped. Despite that, the greens are starting to sprout. More blistering heat, with three days over 100F. Next week is lower 90’s. Watering limits still in effect, so if it weren’t for the weeds my lawns would be totally dead. I’m reminded of a drought they had back when we were living in the UK — much talk about playing cricket on the old village yellow. Sunday was quite a bit cooler than forecast. I think it was the smoke from the British Columbia fires, drifting over eastern Washington. Harvested all the peas. One pound unshelled. Two servings shelled. Waited too long, so they were a little mealy, and a little underdone. Given that the peas were planted across about one third of a section, that means we could get three meals out of a KHG section planted totally to peas. Meanwhile, the Santa Maria beans are doing well. The clean sweep I made of the lettuce in Section 2 cleared out all the kholrabi as well. I planted some more on Saturday. Theoretical harvest in mid-September. Also planted some chard, as well. Planted chard and lettuce in Section 3. 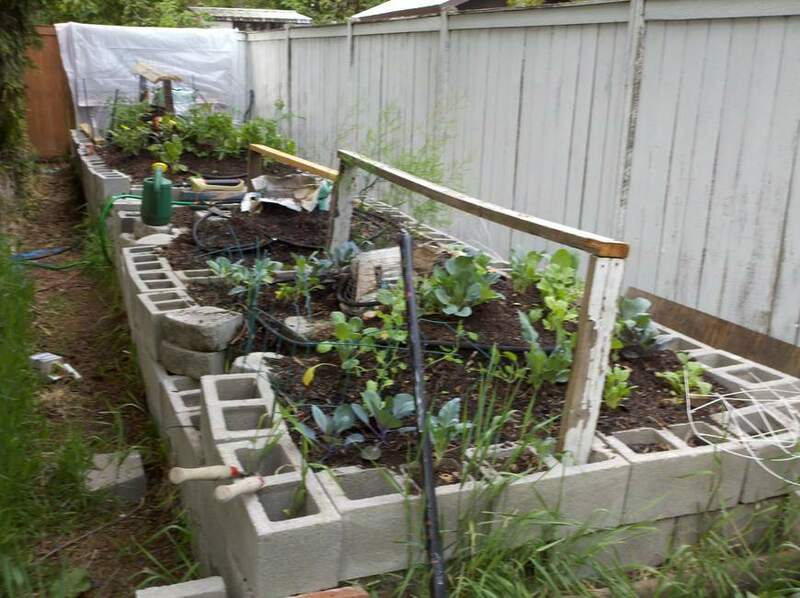 I have two more open spots that I’ll put lettuce into mid-month or so. Cucumbers continue to grow, every plant component but cucumbers. I had to extend the tomato cages they were on, by inverting a second cage on top of them. The trouble is, the heat keeps killing the flowers. Fifty feet of vine, no cucumbers. On Saturday morning, none of the tomatoes were ripe enough to pick. Sunday, five of them were, but four were badly BER’d. I picked a couple and cut off the blossom ended end. They were a little short of ripe, but tasted good. Section 3: Bush beans. Doing well. Due mid-July (except I think the heat has retarded them). Santa Maria beans, doing well. Lettuce and chard. Section 4: Cleared out. Asparagus in part, but no signs of life. Three panelsworth available now. Note: a ‘panel’ is one of those shelf grids I use to keep the squirrels off. Now, all I need to do is decide what to plant. Section 4 has already had peas in it, and they were looking a little diseased (or heat killed) at the end, so I don’t want to do peas or beans there again. I already have two panels of greens just planted, and another panel that I’m planning to plant later. That leaves essentially one small panel in Section 2, and two large and one small panels available in Section 4. Looking at my seed collection, and leaving out squash (Section 1 is full and the other sections are resting), peas/beans/and greens, my seed stock looks limited to various radishes, and some out of date carrots. And of course, our local stores are out of seeds for the season. I guess I’ll put the radishes in Section 2, with the Brassicae, and the carrots in Section 4. A warm week. A hot week, ere the sun rises. Plants shall be withered, records be splintered. 80’s to start and 100’s to end. Watering restrictions imposed for the first time this Century. How far above average was it? This week last year the highs were lower than our current lows. Pulled the rest of the lettuce from Section 2. We are now grazing our way through three bags of the stuff. As usual, we’ll be done with the lettuce before the first of the tomatoes are ready for a salad. Will plant more, but not this week. Peas are almost ready in Section 4. Not sure what the heat will do to them. 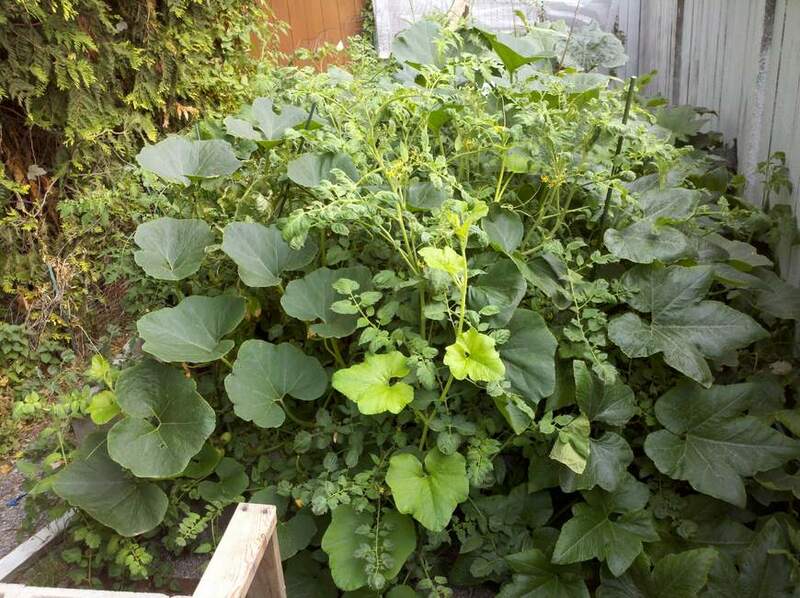 Over in the containers, the cucumbers are trying to take over. Evidently, these weren’t a bush variety. The Asian long beans are just starting to climb. I have a number of Champion VNFT’s coming in, and all seem to have blossom-end rot. I’ll spray them this evening to see what I can salvage. Not sure what VNFT stands for. I think it’s their Myers-Briggs personality type. The big pumpkins are in a sunny spot under the trees and are doing OK. The pie pumpkins are in a shady spot and are not. 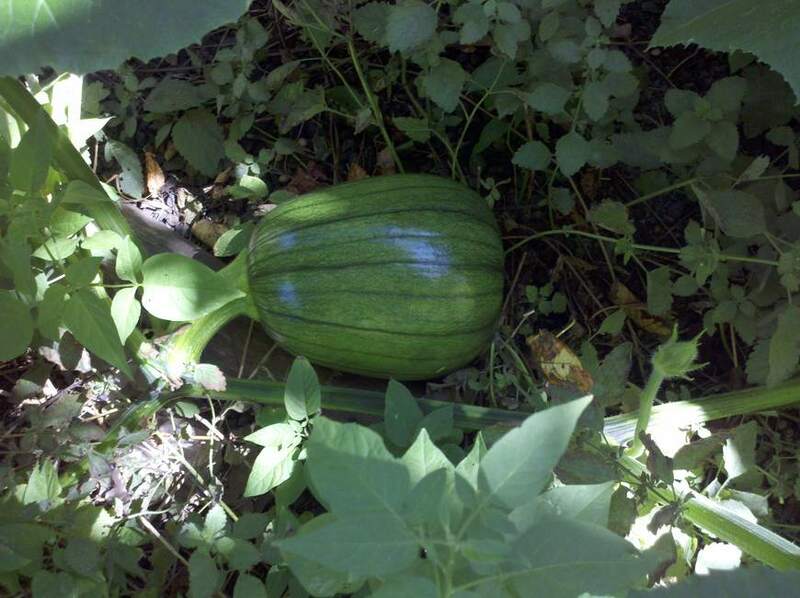 The other pumpkins, next the unkillable rhubarb, have already produced a nice, dark 4″ diameter globe. Warm and dry and windy. Highs around 80. Lows around 60. Dried out the plants such that I had to water the containers twice a day. Lettuce is well on its way to bolting. Pulled up about half of it (and about half of that was edible). One small plastic bag’s worth (the kind the supermarket gives you to put wet veggies in). Will do the second half tomorrow. Harvested our initial bean crop. Blue Lake bush beans. Six plants gave us six beans per plant, except that not all the plants had beans, so figure four per plant. Looks like we need to plant lots more beans to get a proper crop. Next increment is peas, in about two weeks. Theoretically, our Early Girl, Champion, and Sugarsweet tomatoes begin producing this week. Right now, it looks like the yellow tomatoes will ripen first. Everybody’s getting water stressed, with the heat and the wind — a number of them have lost their blooms. Planted accacia and chard last week. So far, nothing’s sprouted. Planted a mix of accacia and radishes in one of the long deck containers. Planted some shiso in the bell pepper container out front. A little constrained in what I can do in the garden because of my cataract operation. Next week the shields come down, and I’ll be able to go back to bench pressing 30lb again. Weather continued its three-days-cold, four-days-warm cycle. Mid 90’s at the start of the week, mid 70’s at the end. Mid 80’s in the forecast. Pulled up most of the cabbages in Section 2. Tried the leaves in a salad. Not impressed. Planted a batch of amaranth and the last of one packet of chard. Pulled most of the lettuce from Section 3, before it could bolt. Planted some amaranth here, as well. This batch we’ll leave for the seeds. People say you can cook them like popcorn. Since they are about the size of a mustard seed, it better be a really short movie. Meanwhile, the green beans are about ready to harvest. And speaking of beans, the pinquito beans I planted last week have started to come up. Still planning on a late October harvest. Our containerized banana pepper plant has produced one small pepper. Very good. Went back to the hardware store for more, but they were out. Got a yellow bell instead. Put it in a big pottery pot out on the driveway. Two weeks of not much going on. Wx cycled between 60F and 80F on a three-days-cold, four-days-warm basis. Due to hit the mid-90’s this week. The heat will definitely bolt all the remaining cabbage and lettuce. Harvesting bags of the stuff. MJ got in very late from a dog show over in Seattle on Saturday, and so didn’t go to church on Sunday. That means we didn’t have a chance to run around tying bags to people’s door handles in the parking lot. Stopped at Huckleberry’s and got some seed. It seems late in the season to be planting seed, but we’re really only a week past official last frost. Put melons in on Friday, also one banana pepper plant. Back ordered some amaranth. Should have it by Wednesday. I ordered some pinquito beans last week. Got them in on Saturday. Planted them Sunday. In the Santa Maria Valley, they plant in May and harvest in early October. I guess I’ll harvest in late October. Warm last week, cool and rainy this week, warm and partly cloudy next week. Made another couple of passes through the hardware store. Butternut squash, Zucchini, lemon cucumbers, pumpkins, herbs. Beans, yellow tomatoes, white carrot-shaped radishes (they were out of daikon seed). The lettuce I bought last report took a while to set up. The Purplestuff is doing OK, but about half the buttercrunch just laid there for a week before perking up. Fortunately, the lettuce I loose planted earlier this year has started to come up, and I think we’ll have a good harvest there before the current crop runs out. I have lots of seed and will plant more every few weeks. All the bedding plants are now in, and the greenhouse is down for the season. Planted some seeds in sections 3 and 4. 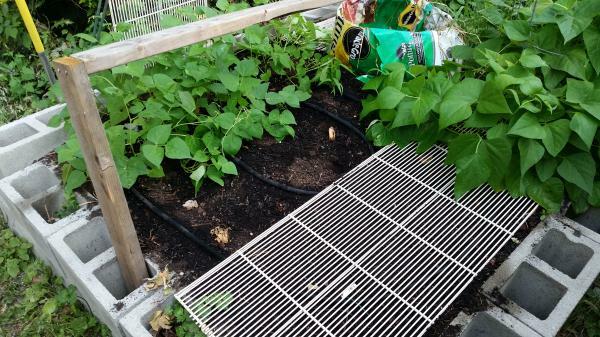 Section 3 got bush peas and spinach, and Section 4 got bush beans and chard. Snow peas in a deck container. I have enough greens seeds for succession planting, but I need to get back to the hardware store for some more peas for Fall. If I don’t buy it now, they’ll have shipped it back. On Friday, I planted some seeds for zucchini and summer squash and spaghetti squash and acorn squash. Two weeks old and already it’s trying to reproduce. Speaking of bedding plants. Two weeks ago I bought some cabbage seedlings. Not large plants, but nicely developed. Not quite as far across as a beer coaster. Planted them. This Friday, I noticed that the purple cabbage was starting to bolt. Yes, bolt. Four days above 70F (just), three days below 60F (easily), six days in-between, and the suckers are a foot high and putting out yellow flowers. 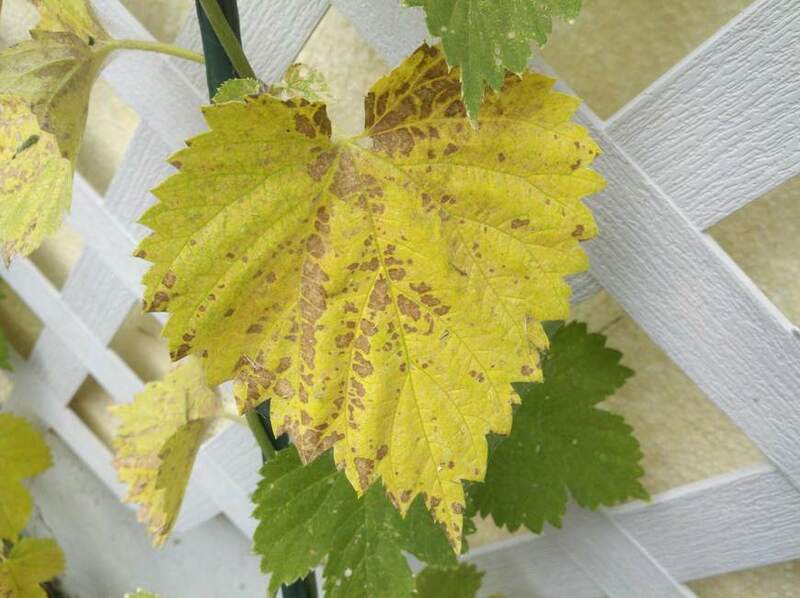 Deb Tolman says the leaves should still be good, even if we only get one salad out of it. We’ll see how the replacements go. For some reason the squirrels aren’t digging as much as they usually do. There’s still scads of them about. I have ASW gear (anti-squirrel webbing) up over Sections 1 and 2, but haven’t done the others yet. 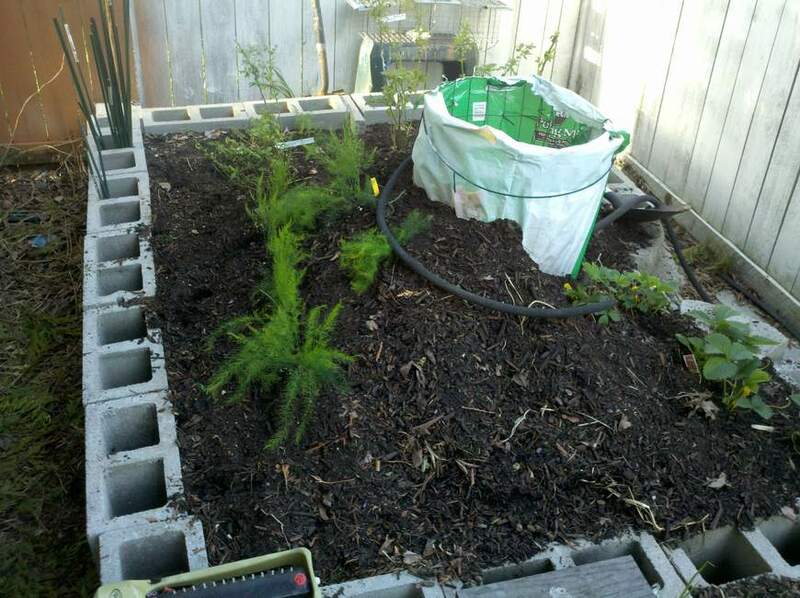 Instead, I just laid the metal shelving from last years composter failure flat on the ground on top of where the seeds are planted. That will keep the critters from digging until I get the rest of the ASW gear up. This weekend marks the start of gardening season — a month early. Last frost isn’t supposed to be until 1 June, but this was a warm Spring. Repaired and recored Section 1. Recored Section 2. Finished laying new irrigation hose on all four sections. Went mad at the garden section of the local hardware store. Put the anti-squirrel covers on Sections 1 and 2. 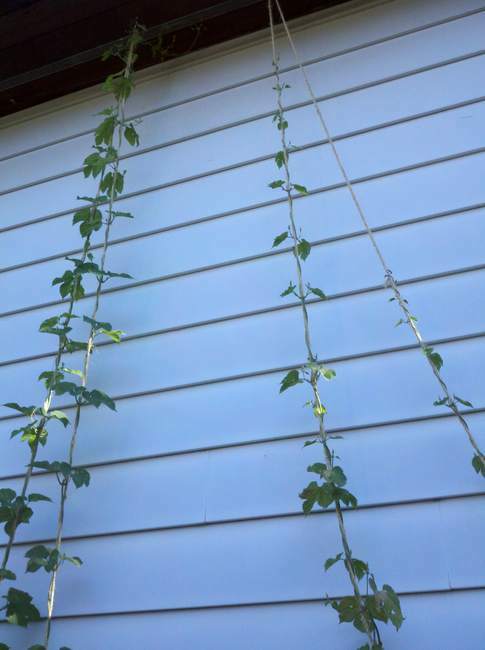 Hung the netting for the hops. Section 1 had a decided droop on the SW corner, an artifact of the original garden wall. 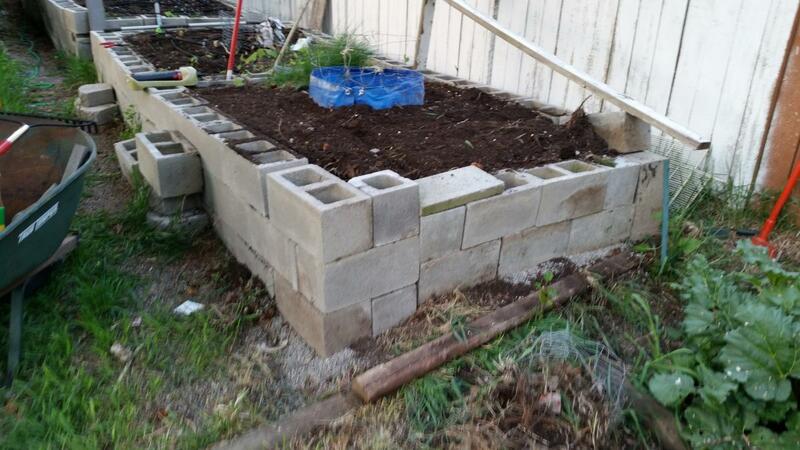 I pulled off most of the cinderblocks from that end, and made an attempt to improve the lay. It sortof worked. The only way to get it right would be to tear down the whole wall. I found some interesting things during the repair work. What, you were expecting Frank Lloyd Wright? First of all, pretty much everything I had dumped into the KHG during the construction phase, three years ago, had rotted into nice, black soil. There were a few exceptions. First, while almost all of the phone books had rotted, the spines and clumps of pages of the thicker ones remained. So get a strong friend to tear those phone books in half before using them. Second, mettalic paper seemed to last — the sort they make teabag packets out of. Finally, I had dropped a couple of 18″ long quarter-rounds of pine into the mix, as a kind of makeshift hugelkultur. They were leftover from the wood for the fireplaces we never used. After three years in the soil, admittedly only one third the time needed for a tanner, they were as good as new, with no signs of rot. So much for Herr Hugel. Second, there was a major difference between the Section 1 basket core and Section 2. Two was filled with lovely black soil, easy to dig out and mix into the main garden. 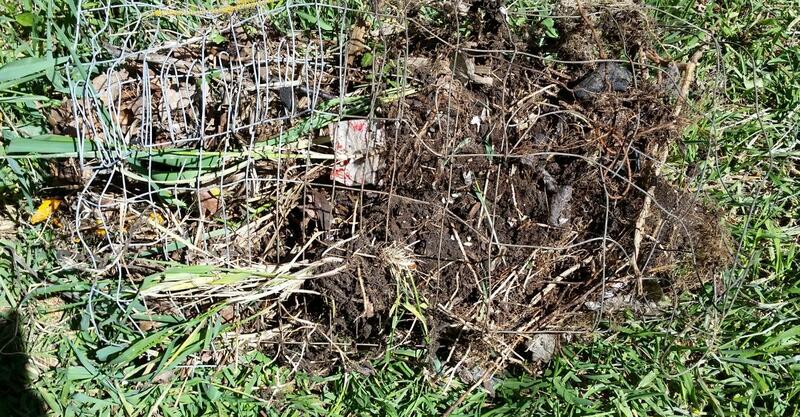 Section 1 (with a smaller basket, closer to the tree, no liner) was full of roots and grass and detritus. As you can see from the pictures, I enlarged it, and added a liner, that will probably rot over the years. I wanted to look for some new sources for seedlings, but wasn’t successful. Google maps gave different results for a “plant nursery” search, depending on if I centered it on Spokane, or on nearby Cheney. This, despite the fact that the coverage areas overlapped. Second problem was, all the plant-nursery/greenhouse outfits I found were either a long ways away, wholesale/ornametals only, or out of business. So, I gave up and went back to our local hardware store. As can happen when one is in a hurry — I go buying, not shopping — it’s easy to lose track of what went in the cart. So I came home with three Patio tomatoes, instead of two, plus two Brandywines, and a Zebra. Also four Bok Choy and eight Savoy cabbage. The cabbage into Section 2. The tomatoes went into Section 1, the deck, and the two hanging baskets (one Zebra and one Patio). Went back to the hardware store on Sunday. Didn’t find any non-hot peppers, didn’t find any peas/beans. bought a flat of lettuce — buttercrunch and purplestuff. Put those in Sunday afternoon (divided more or less equally between, Section 2, Section 3, and a couple deck containers). Planted the squash seedlings what I grew earlier (two buttercup and two spaghetti) into Section 1. 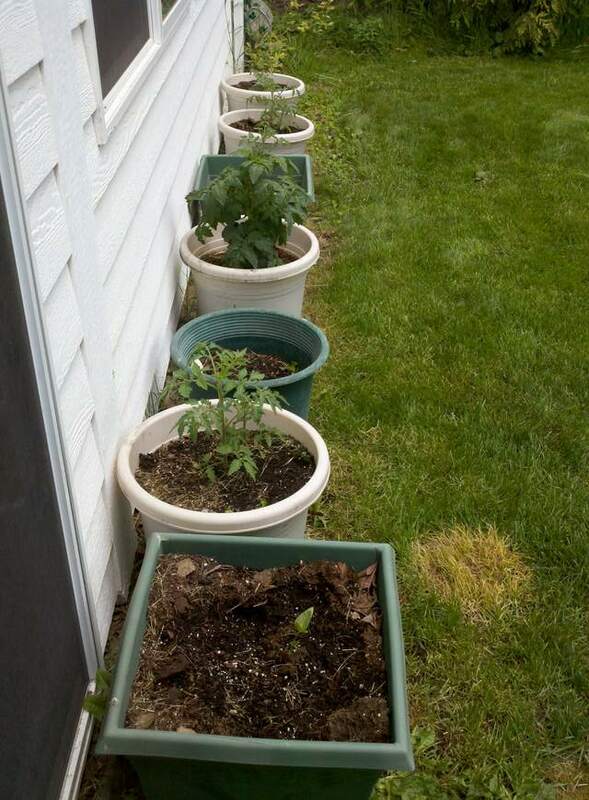 Also put the remaining patio tomato into a patio container and set it on the …. deck. There’s still space left for some other things, but that’s for next weekend. Other than two nights of frost and a day of high winds, the weather’s been nice. Visited friends of MJ’s, who run a small truck farm on the edge of town. Got some pointers on starting seeds and when to plant and so forth. They said I shouldn’t put anything out until after Mother’s day, say three weeks from now. I didn’t tell them I’d already put out six tomatoes — three on the deck and three by the house. Early Girl, Sugarsweet, and a mildew-resistant hybrid. If I’ve got another three or four weeks, I might as well start repairing Section 1. Straighten up the NW corner, and recore the basket. Decided to make another attempt at pinquito beans. Soaked a handful in water overnight and spread them on a wet paper towel. We’ll see. Put new irrigation hose in Section 3. I’ll do a writeup with pictures next week. The weather this week was about like last week’s. No frost (in fact, unseasonably warm lows), but not suitable weather for tomatoes, either, even if it’s great on the coast. Their unseasonably warm lows are 50-55F, our unseasonably warm lows are 38-45F. I decided that as long as it was unexpectedly nice I’d close out the tomato part of the garden. I wouldn’t expect to get more than a couple of cold weeks out of the end of October anyway, El Nino or no El Nino, and this way I can do it on my own time. Beets and greens will be left to their own devices. The deck containers yielded six pounds of tomatoes, but four poundsworth were green. None of them were big enough to bother weighing, and some were positively tiny. MJ wants to experiment with chopped green tomato recipes. I mean the tomatoes are chopped and green, not the recipes. I have one container with four cabbage plants in it, that I hope will produce something before the snow falls. 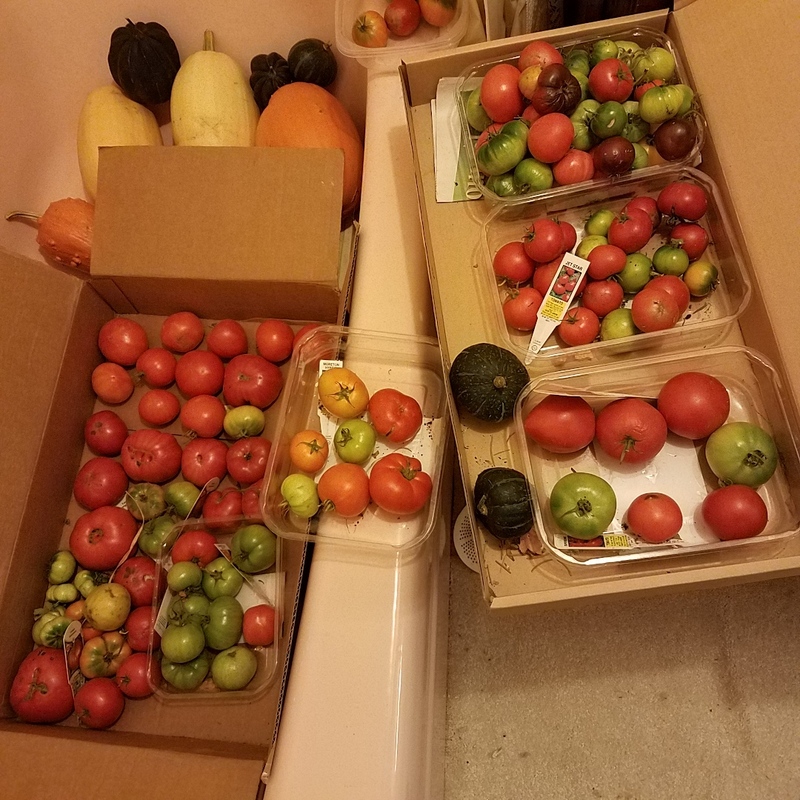 The yard containers produced nine pounds of tomatoes, seven of which were green. The five ounce “Beefsteaks” were finally starting to turn. I’ve left the two lemon cukes to hang out for a while, and see if they get any growth. In the KHG itself, I got 15lb of tomatoes total, including 2.5lb of ripe ones, and a handful worth measuring. The heaviest was a 6.5oz Marglobe. The Beefsteaks didn’t make the cut. Also harvested were just over half a pound of unshucked lima beans. I’ll let you know how that works out next week. Unlike last year, I didn’t find any errant squashes while doing my tomato-whacking. Total tomatoes this week: thirty pounds, only six pounds of which were ripe…ish. I haven’t emptied the containers yet. My plan is to dump the greenery into a back corner of the yard, add leaves, once they are done falling, and cover with container dirt. Meanwhile, last year’s container dirt is composting nearby. So, we round out the year with 125lb of veg, including 97lb of tomatoes. That’s two-thirds more than last year, and probably about the same as in 2012. 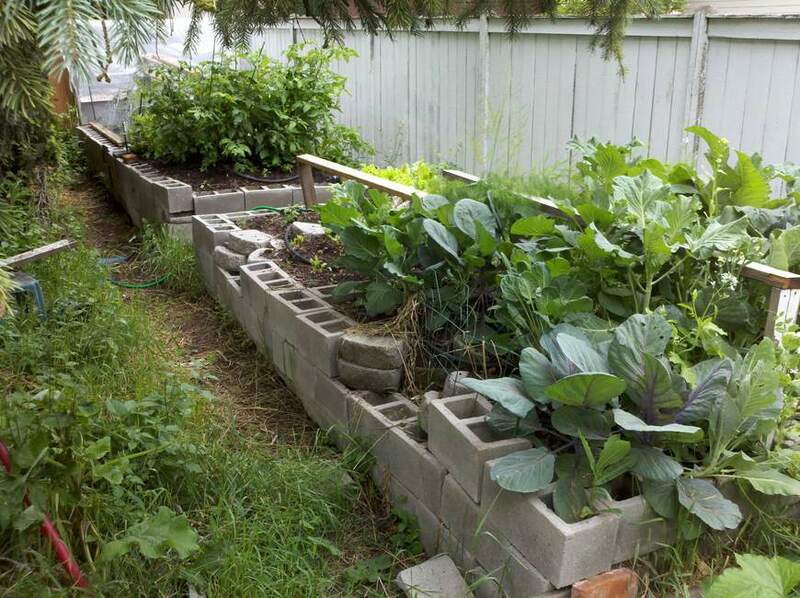 Of course, if the cabbage and the beets come through, there will be a little bit more. The weather turned Autumnal this week, but in a good way. Off and on cloudy and breezy, with spotty rain. Eighty F at the beginning of the week, and 62F at the end. Still no frost in the forecast, but cold and rainy. Some of my bigger (6oz) tomatoes are ripe, so that’s nice. Harvested those, some smaller ones, and a pound and a half of some big cherry-sized. Beefsteaks are just beginning to show color, so we’ll have those to harvest in a week or so, plus a bunch of green ones, pre-frost. Harvested my ten bean plants, and got about 4.0oz of pinto beans out of it. We soaked them overnight and MJ did them in the pressure cooker. We had them with Santa Maria BBQ, and they were superb. Container peas still haven’t sprouted yet, so I expect there’s something about using a former tomato pot that they don’t like. Neither has my last planting of lettuce. Not sure what the problem is. Since this is my last nice weekend, I decided to start closing out the garden. Section 4 onions had all fallen over, a sign they weren’t going to get any bigger, and the white radishes in Section 2 were a week past their harvest date. So I pulled up all of those, plus some carrots that wandered by. 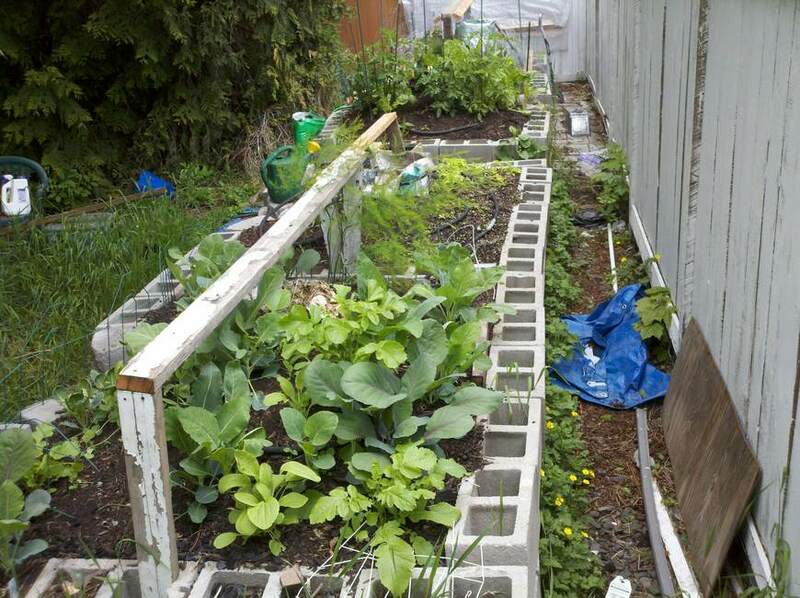 I still have the red radishes, the beets, and whatever greens decide to keep growing. Also pulled down the hops. I wanted to get them down while they were still green, and before the berries started falling off (hops berries are poisonous to dogs). I’d put up some plastic bird netting for them to climb on, so it was just a matter of unhooking the net at the roofline, then cutting everything off at the groundline, rolling up the net, and putting it in the trash (can’t compost nylon). This time last year we were fully done, with frost on the way and all the tomatoes cut down for indoor ripening. Total harvest was 47lb of tomatoes, and 76lb of veg overall, not counting the 40lb of jack-o-lanterns. I don’t have an overall total for 2012, but we closed out the tomatoes this week, for a total of around 100lb. So far in 2014 we have 67lb of tomatoes and 28lb of otherstuff, for a total of 95lb. Shows you what kind of uncertainty farmers live with. The weather this week was beautiful. Highs in the low 60’s, lows in the low-but-not-freezing 30’s. Cloudy/foggy mornings. Sunny afternoons. West of the mountains they’re under a monster high pressure inversion layer, and that’s driving our weather. Too bad I’m in class or meetings or conferences or workshops or interviews or luncheons. Forgot about the carrots. They were at the north end of Section 4, under the blueberries. I figured I’d best dig them now, before they freeze to the ground. Got 15 of them. Five were 2oz monsters (bigger than my thumb!) and the rest were small. I’ll probably let that area go into blueberries or strawberries or asparagus next year. Otherwise, just fiddling with the winter preps: cleaning up the residue, digging over the garden, hanging up the covers, trimming back the hops (and disposing of them so the dogs don’t get poisoned). I’m waiting for the asparagus to brown out before cutting them back and mulching with the leaves that haven’t fallen yet. UPDATE: Did I say hadn’t fallen? Our traditional Sunday night windstorm (sustained 40kt, gusts to 60), just brought everything down. Fortunately, I spent part of Sunday afternoon clearing off the deck. I left the container tomatoes wrapped up for a week, and uncovered them Sunday afternoon. No change. Tomatoes that were orangish going in, were orangish coming out. I suspect it’s just been too cool for them. We have a bunch of cold clear nights coming up, with minimums down to 33F, which is reallyreally close to 32F, with highs that are all below 60F. So in between crashing on projects on the computer, I harvested everything. I know I’m supposed to pull up the whole plant and hang it somewhere warm, but when I got into the master bathroom MJ said she didn’t really want that, for some reason. What’s the harm? I mean, she hangs her underthings there. So I have about half a basket of almost entirely green tomatoes. 12 pounds, total. I left the big-cherry-sized ones go, so all of them are over an ounce, but none of them are over about five. Average size for the season is just over two ounces. Total tomato take was just under 50lb, compared with last years’ just over 100lb. Counting the pumpkins (which is still kindof cheating), we got 117lbs of foodstuffs. I don’t think I’ve spent as much as $120 on the garden this year, but I’m sure it was over $60. As has become traditional, the publication of last Monday’s report was immediately followed by two days of wild weather, with sustained winds of 40mph gusting to 50. When it wasn’t winding it was raining, about half an inch worth. Despite the lack of frost, the long beans didn’t survive. By Monday afternoon they were all wilted, and the beans were still only 3″ long. The lemon cucumbers didn’t survive. There was only one worth picking. As a precaution, I harvested the KHG tomatoes and squash. Less than half a basket. 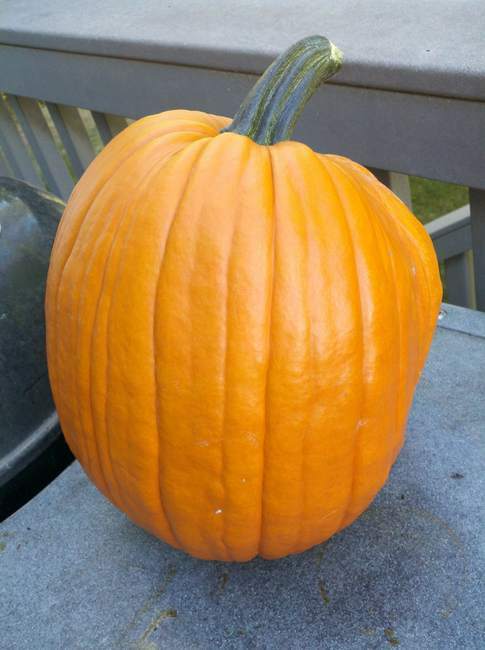 I also harvested the just-breaking pumpkin, and found it quite orange on the ground side (22lb). The projected lows were in the lower 30’s with one night of light frost, so I harvested any tomatoes with color from the container plants, and then watered them and wrapped them all in plastic. I don’t plan to open it up for a week or more. I don’t expect to get more than 5lb of tomatoes there, bringing the total to maybe 40lb or so. This time last year I had close to 100lb. I harvested the KHG corn, 10 ears of corn, 30oz worth (when husked, but not stripped from the cob), two were six inch long monsters. It tasted much better than the deck-grown, but I still think it’s too much trouble. In KHG Section 2, where I planted lots of lettuce two weeks ago, almost nothing has come up. Well, a mass of seedlings came up in one corner, then disappeared. I suspect slugs. On Sunday, our last really warm day for a while, I replanted, and then liberally dusted with diatomaceous earth. I used that heavily earlier in the year, and am down to my last 40lb. Cooked up one of the Delicatas. They’re a lot like Acorn squash, with a slightly sweeter flavor and a slightly different texture. We will do them again next year. Note that they were nothing like the picture on the packet. The packet squash are long things, like pie pumpkins. Our Delicatas were the same size and shape as an Acorn squash, but the packet-depicted Delicata coloring. Nothing to report. The weather this week was cold and rainy and windy, with next week being more of the same. Nothing got ripe. Nothing was harvested. I’ll probably close out the garden this week. And just like that, we’re autumnal and I’m doing some shutting-down-the-garden things. The weather this week was cool and intermittently rainy. Highs in the mid-60’s (with a couple in the 70’s) and lows in the mid 40’s. The forecast is for a continuation of the trend — lows around 40, highs around 60, with intermittent rain. We’ve got some men coming round next week to cut the excess bits off our trees, the ones the pumpkins are growing under. Harvested the ripe pumpkin (19lb), and moved a crown squash vine with one adolescent squash out-of-the-way of the boots. I’m not going to count the pumpkins in the weekly weight totals, that would be like piling on. 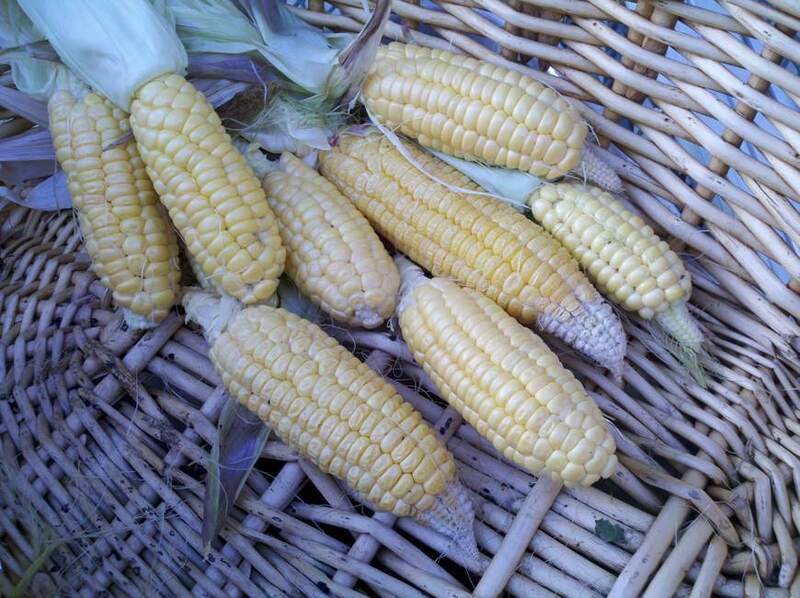 Harvested the deck corn. 16 plants => 8 ears in the 4″-6″ range. 22oz total trimmed ear weight. I suspect I didn’t grow enough plants for them to pollinate properly. 15-20 plants left, over in the KHG, but they went in later. Given all the problems I’ve had, for such little gain (the flavor was good, but it was tough, and stuck to my teeth), I’ll probably not plant corn again. All that work for this? Originally we were forecast to hit 34F next Friday night (now the predicted low for the week is 39F), so I trimmed the tomato plants way back, to try to get some ripenizing in before then. On Saturday I harvested everything that had any color. I’m hoping the real frosts hold off, because much of my garden production last year was at the end of September and beginning of October. A little disappointed with the KHG tomatoes. 14lbs of ripe or ripening or green-but-my-shears-slipped. Almost all under 2oz, or less. Almost all Early Girls. The two biggest were 6oz. Some didn’t produce at all –they were long leggy things that were just now starting to flower. Another two months of warm weather — say, into mid-December — and I’d have a bumper crop. Also picked the two Delicatas that I’d been letting grow. Except that they didn’t. They came in at 2lb each, about the size and shape of an Acorn squash, only yellow. There’s half a dozen summer squash that I decided to hold off on, plus maybe a dozen KHG tomatoes. So far, the container tomatoes have outproduced the KHG, but I think that’s because they got a lot more sun. Also made a first pass through the deck containers. About 30 ripe, etc, totalling 4lb. My foot long beans are now up to three inches. I doubt they make it. 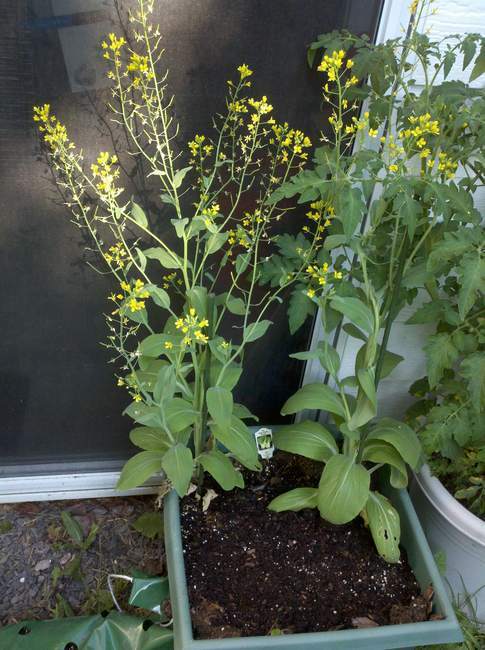 My lemon cucumber (container) produced a myriad of blossoms, and no fruit – it was planted late, as a cabbage replacement. My dwarf watermelon produced one grape-sized melon that I doubt will have a chance to get to be plum sized. UPDATE: As is becoming an unwanted tradition around here, a few hours after I posted this a pretty fierce batch of thunderstorms came through, heralded by some pretty fierce winds and blowing dust. The deck corn is down again, and I ain’t going out in the briefly-illuminated dark to see what else is happening. NWS is saying things like “get inside a strong house and away from the windows”. They obviously have no idea of the current standard of US house construction. The weather this week was back to dry, with hot days (high 80’s) and coolish nights (low 60’s). In the Spokane area, the average date of the first frost is September 15. This year, the 15th was sunny, with a high of 92F and a low of 61F. I don’t feel cold at all. I feel fine. I think I’ll go plant some more stuff. The long beans (Dow Gauk / Vigna unguiculata sesquipedalis), have started to produce. Well, produce is too strong a term. I had two sets of two flowers each on Monday, and Friday they fell off to reveal the cutest little beanlets you’ve ever seen. 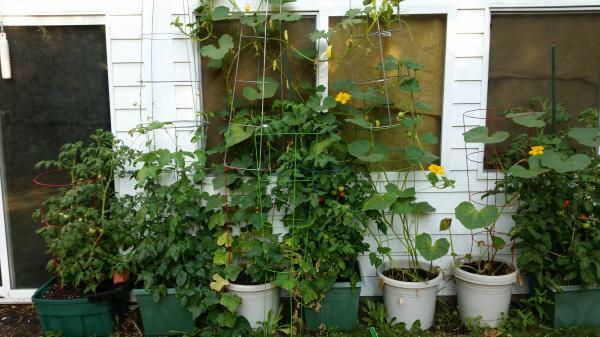 The vine has been growing for weeks, is well over two tomato-cages high (yes, it’s over the light fixture in the pic), and might not produce much more, because they are not frost-hardy, and, you know, the 15th. Meanwhile, I harvested the beets. Only two months overdue, but I don’t think that matters much in beets. They didn’t do well, probably because I didn’t thin enough. About half were in a long container, and the others were in the KHG. Detroit Dark Reds are supposed to be 3″ diameter, but the biggest ours got was 2″, and most were 1″. 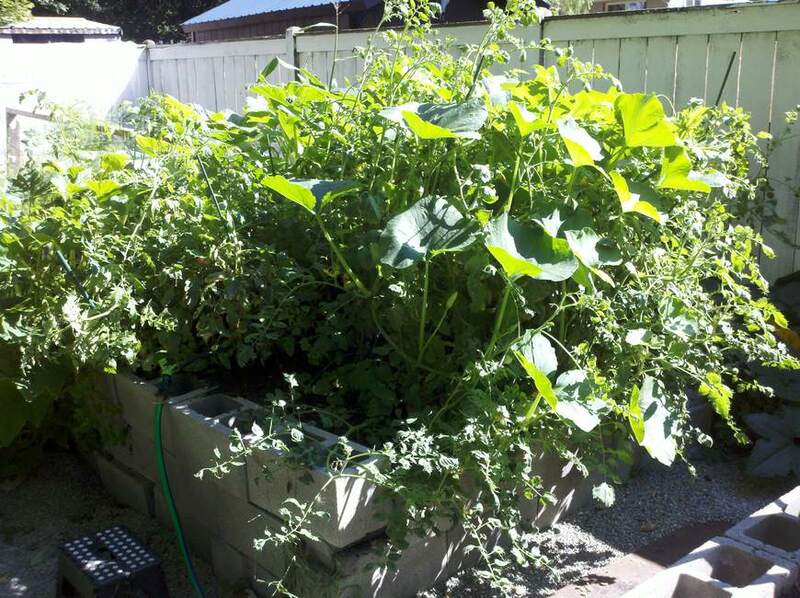 The container-grown were easy to harvest — dump it into the wheelbarrow and paw through the dirt. I trimmed the tops and the roots outside and washed the dirt off with the garden hose. Then I brought them inside and washed the garden hose carcinogens off with tap water. Small beets are really hard to peel. All of Section 2 was empty, because none of my second lettuce plantings had come up, and I had harvested the beets. So, on Sunday, I dug it over and planted one side in spinach, and the other side 50/50 chard and lettucen. It turns out that MJ isn’t a fan of beets, so we shan’t be planting them again. The weather this week started out showery, then rainy, with t-storms. Temps were in the low 80’s, but plunged to 65 by the end of the week. Here come the tomatoes. Harvested 13 early in the week, with an average weight of 1.7oz. That’s a little misleading, because there were four that ran close to 4oz each, with the rest being cherry-sized, despite not being cherrys. Later in the week I got another 13 tomatoes, totalling 33oz, including a giant 5.5oz one. Harvested one of the Delicata’s, possibly too soon. It was about two pounds, and the grooves were just turning green. I guess you’re supposed to treat them like pumpkins and let them grow until first frost. Speaking of pumpkins, I just found a second, bucket-sized one, hidden in the ornamental weeds along the fence. It’s still green all over, but the original one is just starting to turn. I guess it will be ready by Samhain. For some reason, none, as in zero, of my lettuce replants have come up, as haven’t any of the container beans. Did I plant too greedily and too deep, or did I just not water enough, or too much? One bean came up in my container replant, so I’ve re-sown. Harvest date should be around the first of November. I think the squash are winning the perennial battle with the tomatoes. They’re spilling out on both sides of the KHG, and on the South end. 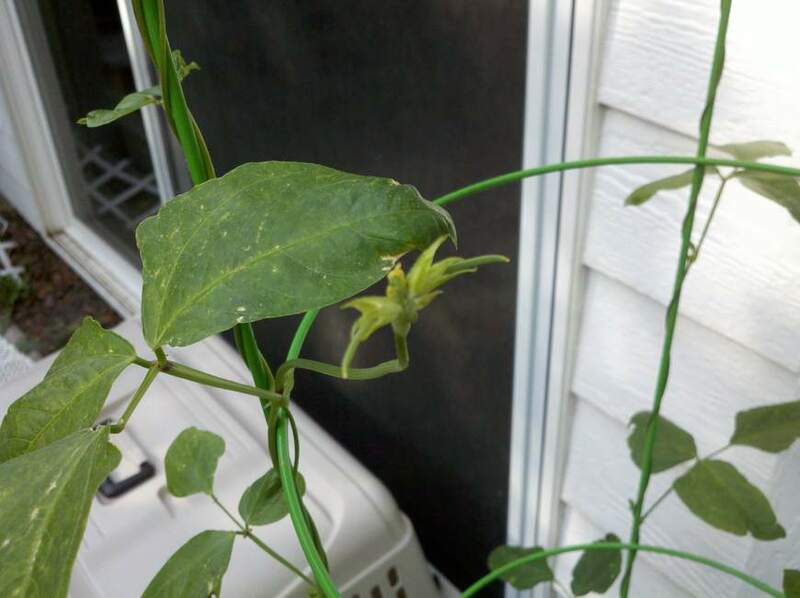 Over on the North end, one adventuresome vine looks to have grown a couple of feet in a couple of days, headed for Section 4 and the strawberry patch. The corn is hanging in there, despite having one of the containers tipped over by the t-storms, again. My red pepper spray seems to be helping against the squirrels. I peeked into one ear, and there’s still an inch or so of kernel development needed. Maybe the middle of the month. The hops are coming along nicely. I figure they’re covering about 15% of the area I want shaded. I have started fertilizing them with the remains of my making of dashi from scratch — a 2×2″ square of seaweed and a quarter cup of shaved bonito (with all the taste gone) per batch. The seaweed gives lots of minerals, and the bonito is a slow release fish fertilizer. If my addition is correct, we’ve gotten almost 20lb of harvest so far. I don’t think that’s as much as last year, but it’s more than I thought we’d done. And I’m not even counting the pumpkins. The weather this week was very warm (upper 80’s) and dry. Typical for late August. Now we are at the beginning of September, and we start our race between late ripening tomatoes and early killing frost. Harvested a handful of tomatoes, mostly Early Girls, but a couple of the yellow Husky Golds. Still running about 2oz each. Some of them seem a little watery, so I’m cutting back on my watering schedule. I’ll do the KHG plants once a week. The container plants will still get watered daily, but at half the amount. If they droop in the afternoon, I’ll give them the other half of their ration. I sliced up the small one for miso-cucumber salad. Meanwhile, the hot pepper spray seems to be keeping the squirrels off the corn. We’ll see what it does to the taste. The weather this week was the usual. Highs near 90, lows near 60. A smidgen of rain on the edge of a passing thunderstorm. Not enough to wet the ground under the trees. UPDATE Monday 2AM: Well, that was fun. Line of severe thunderstorms came through just as we were starting Episode 10 in our marathon rewatch of Girls und Panzer. A one minute microburst blew stuff all over the deck, including the container corn. Power out for hours and just came back on. I’ll update again before I post this, but right now, there’s still two episodes to go. UPDATE Monday 6AM: Damage confined to the deck. A couple tubs blown over. One blown off its stand. None of the corn actually broken. The same overhanging trees and fence that protect the KHG from exposure to sunlight protected it against the wind, so no damage there. UPDATE Monday 9AM: One of the corstalks, back in the corner, was snapped off like it was a sugarcane. I’ve staked most of the remaining corn. UPDATE Monday 9PM: Evidently, we doged a pretty big bullet. The really nasty storms cam through north and south of of us, snapping big trees and tearing up trailers and cutting off power for thousands in Spokane and the general environs. Squirrels got into the Section 2 corn, the most mature, and pretty well trashed it. I salvaged about five immature ears, got half a cup of kernels. 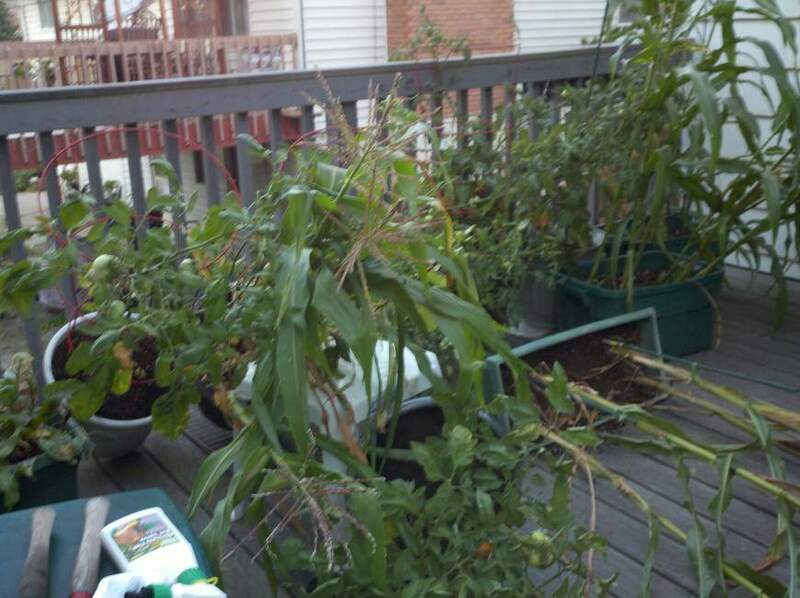 I’m spraying the deck corn and the Section 1 corn with hot pepper solution every day. We’ll see. The red tide is a’coming. Just not yet. Harvested eight smallish tomatoes (20 oz total). Probably ten more ready by next week. Another 50 or 60 sitting there, green. Otherwise, got two summer squash (12oz), one 2.5lb 8-Ball that I harvested later than I should have, and one 2.0lb crown squash that I thought was an 8-ball (and I probably harvested too early). Tomorrow I’ll post a recipe for 8-Ball squash. 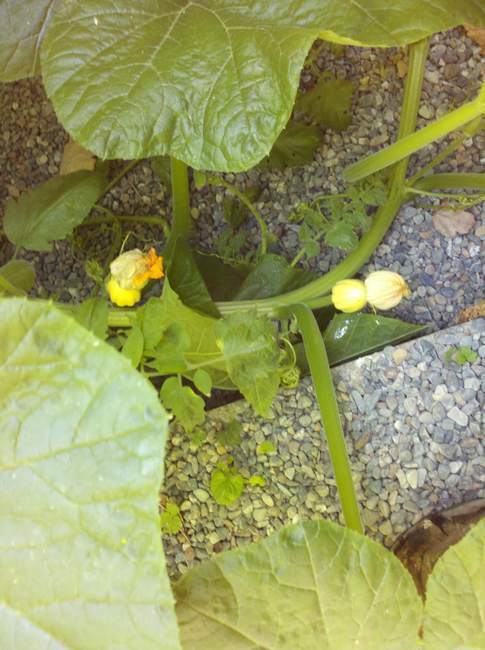 There are about six or eight Delicata/Spaghetti squash coming along. I slash the names ’cause I’m not sure. They don’t have green striping like the Delicata are supposed to, but they have longitudinal groves, which the Spaghetti are not. Hide and watch. Planted more Brassicae in Section 1, under the corn and next to the peas. Brussels sprouts and Broccoli on one side, Cabbages and Cauliflower on the other. Should be easy to keep straight. Cabbage should be ready mid-November, and the rest at the end of the month. Not sure if they’ll die of frost, or if they’ll cross-pollinate and produce monsters, but once again, we’ll see. Saturday I dug over the Section 2 cornfield and planted spinach and lettuces. Never had much luck with spinach. The hops are doing well. Much of the browned leaf areas are sprouting again (piling on the compost and giving them more water did the trick), and the tops have bushed out something fierce. To bad this is one of the areas we sprayed for carpenter ants — I wouldn’t want to eat anything out of here for another couple of years. I planted the hops as ornamentals, and to give shade in the late Summer. I have high hopes for next year. The weather this week was typical for mid-August in the NENW — highs in the mid-80’s and lows in the mid-50’s. No rain, and it probably won’t rain until mid-September. My efforts to curb the blossom-end rot seem to have worked, and the summer squash is starting to come in. I suspect we’ll be eating one per day before too long. No more 8-ball yet. There’s a couple that are coming along. The spaghetti squash is just starting to produce little thumb-sized yellow fruits (unless it’s the Delicata). Also found one biggish pumpkin in a back corner of the yard. Now, which plant did this tomato come from? tomatoes also starting to ripen — I found four Early Girls (I think) buried under the foliage at one corned of Section 3. I say I think, because even though I recorded where I planted each plant, they’ve kindof grown together. Harvested the last of the lettuce and I think I’ll let the soil rest for a bit before I put in the winter chard. The Corn I planted in Section 2 is producing heads, and should be ready by early September. The corn I planted in Section 1 (to replace the cabbages) is doing well, and so is the corn I planted in containers on the deck. Maybe late September for them. 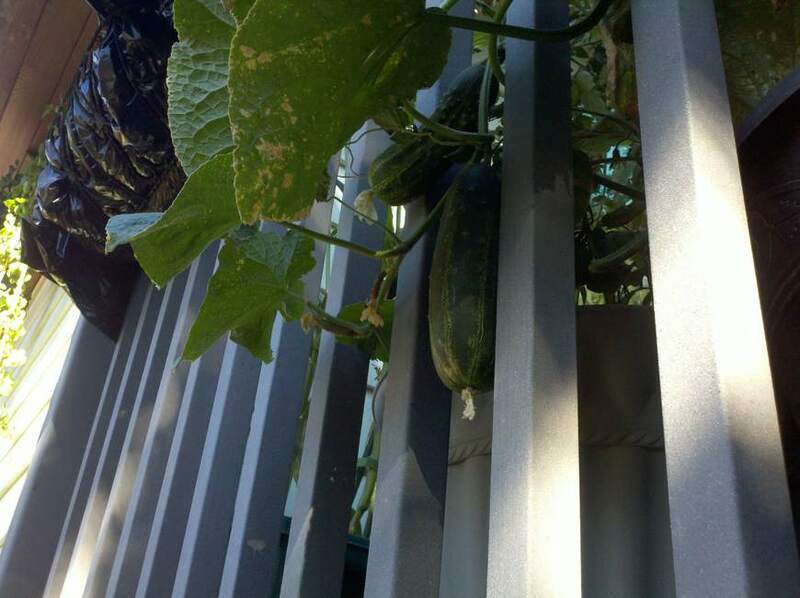 Speaking of containers, the miniature cucumbers have climbed out of their pot and are now hanging out off the end of the deck. And finally, the hops are doing well. All bushy at the top and starting to leaf out along the stems. Of course, the worst heat of the year is over, but they’ll still provide a bit of shade, and I have hopes for next year. Weather was warm and dry, except when the T-storms came through. Twenty minutes of moderate rain, about a quarter inch. The weather this week was surprisingly wet. Rained steadily for a day and a half. We got about an inch, so it wasn’t a downpour. Good, as they say, for the crops. Also the mosquitos. Next week, back to the heat. Growing stuff continues to grow. Lots of tomatoes, nothing ripe except some S-100s. Harvested the first 8-Ball squash. They are just round Zucchinis, but you can do interesting things with them. Deck corn is up to my armpit. KHG section 1 corn is 8″ or so high. Harvested the last of the container peas and pulled up the plants — they were pretty heavily mildewed. I had started some lemon cucumbers with the thought of putting them in an hanging bag, like the S-100s, but realized I didn’t have any place to hang it, so I planted them in the container peas container. Hops 1, 2, and 3 are all doing reasonably well, and are spreading out, now that they’re at the roof. The only trouble is, the area they are shading is already shaded by the roof overhang. This is obviously a multiyear project. Not-growing stuff continues to not grow. The peas I planted last week haven’t come up yet. May have planted too deep. 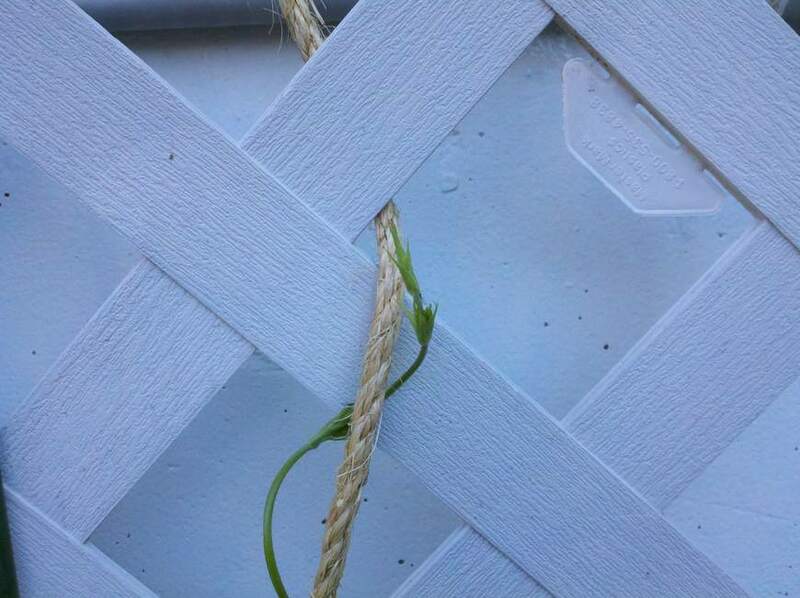 Hop plant #4 is still stuck even with the deck. Doesn’t look particularly sickly, just stunted. Carrots at the N end of section 4 aren’t doing much, either. I got a bunch of pea gravel for the dog run, way more than I needed, so my project this week is moving the excess to the KHG to make paths around the perimeter. The weather this week was same-o, same-o: highs in the 90’s, lows in the upper 50’s. Rinse and repeat, except there’s no rinse. My neeps are doing well. 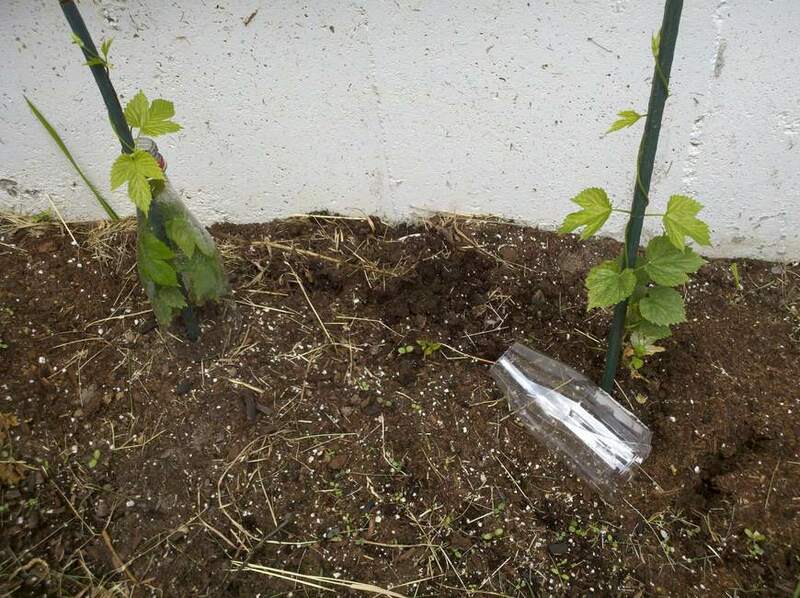 Two of the hops are doing well (I added a lot of compost to the bed and watered it in). The other two remained stalled. One EarlyGirl tomatoe is almost ripe. Most of the rest have fruit, but none of it is red, or even breaking. Looks like I will have one or two young summer squash by the time the tomato is ripe. I lost a bunch to blossom-end rot, but have been seriously supplementing their Ca input since. My three sisters planting plan hit phase 2 this weekend. I planted peas next to each of my cornstalks, about 40 plants. Based on my earlier harvests, I can get a scant quarter cup of shelled peas in one pass from four container plants. That means 10 plants will give a comfortable half-cup, or one serving. So I need 20 plants to feed two people. We’ll see how that math works out. The weather this week was, like always, hot and dry. Next week, well, you know the drill. Lettucoi are thinking about bolting. Harvested enough for a week, and it will be a race between eating that and having the stuff not harvested start to bolt. About time to plant some more. Corn is coming up. Lots of small green shoots, much bepestered by slugs. I’ve put down some diatomaceous earth, to help them slice their little bellies open. If that doesn’t work, then slugbane. Tomatoes are starting to appear. Nothing much bigger than a golf ball yet, and all still very green. Daw Gauk beans are getting a good start. Maybe 6″ high. The hops are feeling poorly. Leaves turning brown and crumbly. Not sure why. Growth is slowing also. Effect is most noticeable on the RH side of the bed. 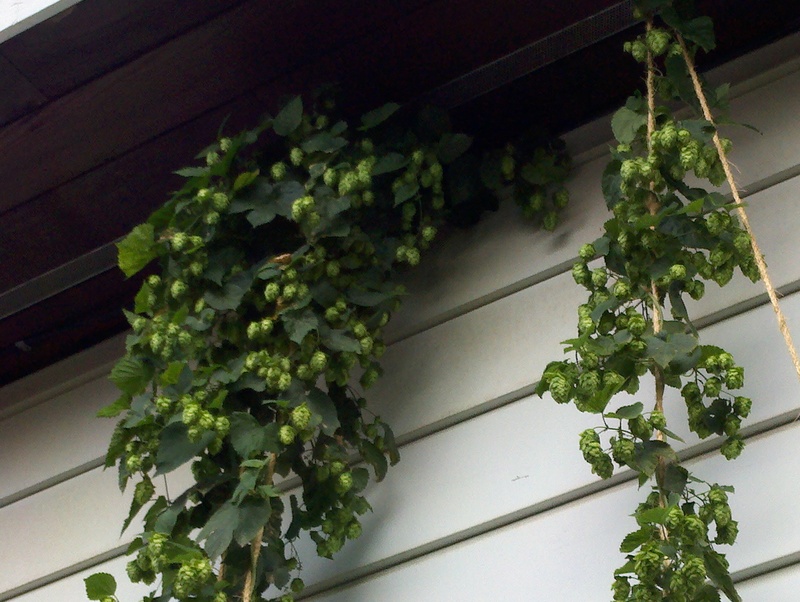 Hop #3, the biggest and fastest growing at first, has stopped short of the roofline, while #1 and #2 are already up their, banging their little vegetative heads against the soffit. #4 Hasn’t even cleared the deckline. No sign of bugs. No sign of disease. Maybe too much water. Maybe not enough. Maybe needs food. Maybe overfertilized. Who knows? Nothing much scheduled for the coming week. Letting the garden grow. Watering every third day or so. If the corn does well, I’ll plant beans or peas next to them. The weather this week was hot and dry, then cool and windy, then just cool — cool for July anyway. As Terry Pratchett said “Remember – that which does not kill us can only make us stronger. And that which does kill us leaves us dead.” This week I learned another important lesson: RTFM! The weather this week was, as it will be through August, hot and dry. My hops are already 12ft high. Pics next time. I have hit on a method of watering my hanging tomatoes (the S-100 and the Husky Gold). I poked five or eight thumbtack holes in the bottom of an empty butter tub and put it in the top of the hanging basket. Not a self-watering setup because it drains too fast, but it does give the water time to spread out, so less runs out the bottom. 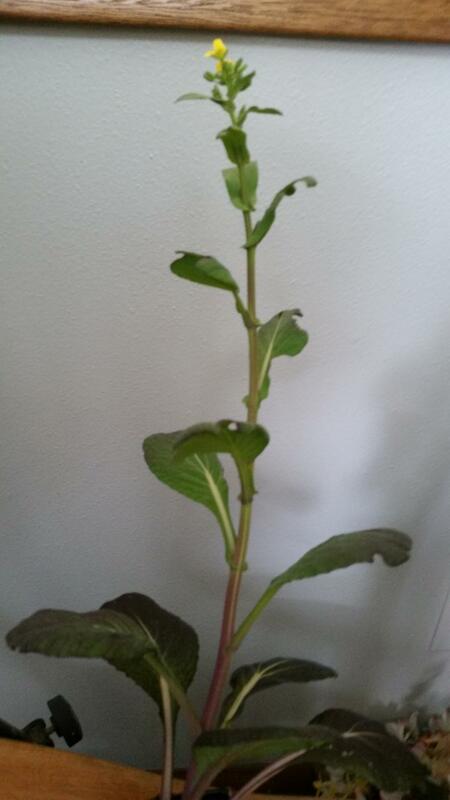 Also, in mid-march, I bought some bok choy seedlings (’cause mine had died), and planted them in a container. They were little 1/10 scale models of the bok choy you get in the supermarket. Here’s what they look like now. Finally, we have one (I counted) S-100 tomato, grape sized, that’s started to turn red. Should be ready to give to my niece-in-law to eat on the plane. Assuming that TSA doesn’t confiscate it for being of the nightshade family and therefore poisonous. The weather this week made the transition from coastal Spring to desert Summer. We started in the upper 50’s and wet, and ended in the upper 80’s and dry. In the right front are the brassicae of Section 1, doing well. Section 2 is lettuce, with most of it growing on the right hand side. Section 3 is tomatoes and squash, and the barely-visible-if-you-know-what-you’re-looking-at Section 4 has the startup blueberries, strawberries, and asparagus. You can see the 2×4 that’s holding down the anti-bird net. In the right front corner and not officially part of the KHG is one leaf of the pumpkin, currently losing a battle with the Unkillable Rhubarb. Yes, there’s lots of weeds about, but it was raining until the morning of the pic, and there’s essentially no weeds in the garden. One of the nice things about a KHG is that they are low maintenance. I clean it off in the Spring, plant the plants, and stand back. I’ve put in a drip watering system, and if it’s dry, I’ll run it for half an hour or so, every second or third day. Every couple of weeks I’ll give it some plant food. The biggest maintenance headache is keeping the weeds off the path around it. I have a couple of container plants that were not doing well. Not dying, but not growing, either. On Wednesday, after the rain stopped, I found standing water on two of them. Turns out, these were new containers this year, and I didn’t notice that they didn’t have holes in the bottom. So I pulled out the plants, dumped the soil into a spare container, drilled some holes, and dumped the soil back in. Water poured out. The plants are already looking better. Lettuce is doing well. Gave a big bag away. Didn’t make a dent. 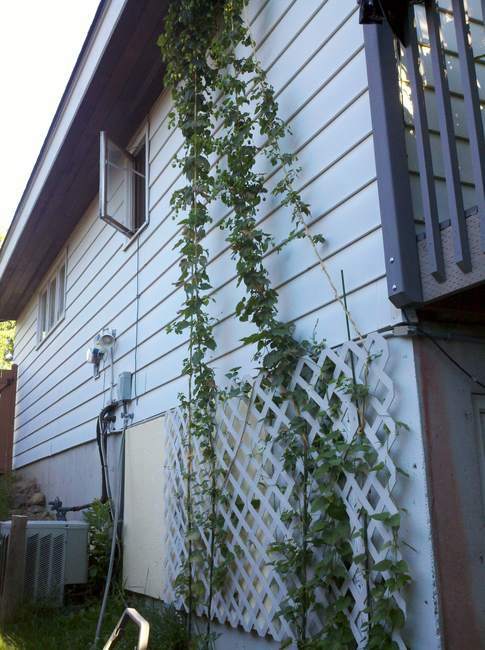 Hops are now 9ft tall. Summer squash starting to produce, but the first one has blossom-end rot. Need to get some calcium spray. The lettuce is growing so fast I had to start giving some away. 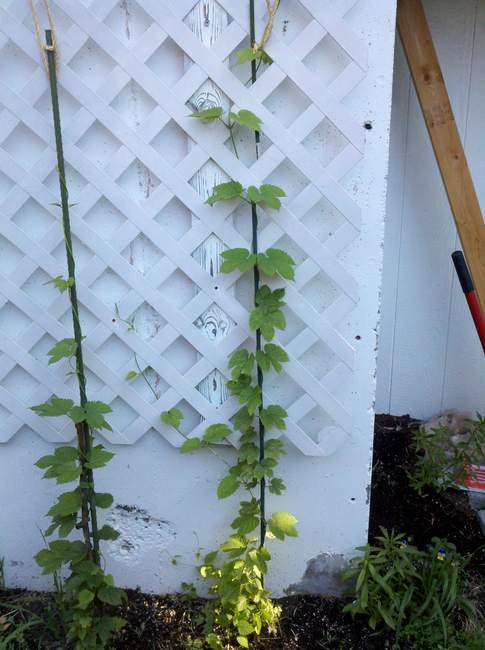 The hops, lacking a strong sun-signal to track, languished at the six foot level. The corn seedlings are big enough to transplant, but there’s no place to put them. Everything is packed, or grown big enough to shade them. I’ll try a container. At least they’ll be close enough to cross-pollinate. We harvested the peas from the potted plants that MJ bought. Oregon Sugar Snaps, so we blanched them and had them in salad. Got two meals out of them, which means they weren’t really worth the expense. Good, though. In fact, that was our first meal where all the greens were from our garden. Too bad the lettuce matures two months before the tomatoes. *When I say ‘cool’ I mean record setting cold. No frost, but we sat at 45F all day Thursday, so that our high matched the all time lowest high for that date. **When I say ‘similar’ I mean cool to start, with warming on the weekend. In our case, the warming is forecast to be in the top 10% for highs on the last four days of the week. The weather this week started out around 80, and ended around 80, but in between was in the upper 60s. Next week, more of the same. The garden keeps on keeping on. Getting to the end of last year’s chard. This years lettuce is just starting to produce. The S-100 has three pea-sized tomatoes. I seem to remember this from last year — it will throw out some scouts, but the main body won’t arrive for another month. The potted peas on the deck are about ready to harvest. The squash I planted in the new containers is not doing well. One of the three has died, and the other two haven’t moved from the two-leaf stage. On Sunday, I replaced the dead squash with a couple of yellow tomatoes that I bought from the remainder bin at Jarms. The hops are doing well, climbing up their ropes, and the assorted wildflowers at their base are growing, but not yet flowering. We have the wrought-iron equivalent of a window box bolted to the deck railing. It came with a shaped coconut fibre planter, long since gone. I got the idea of lining it with a black plastic bag, and filling that with dirt. Now, I just have to decide what to put in it — full sun and no depth. I’ve got another 16 corn seedlings that will be ready to transplant in another week, plus half a dozen kale. The book says you only need one, which is fine, if you can get that one to live. The weather this week was sunny, with a fresh breeze* from the southwest, and highs around 80. The coming week should see more of the same, except cooler until the weekend. The garden continues. Squirrels got in and dug up half my corn. My storebought squash is doing well. My homegrown squash in pots is still puny (they may not be draining well, or at all), my homegrown squash in the KHG is larger, but distorted, and one of them has grown white fur on one leaf. 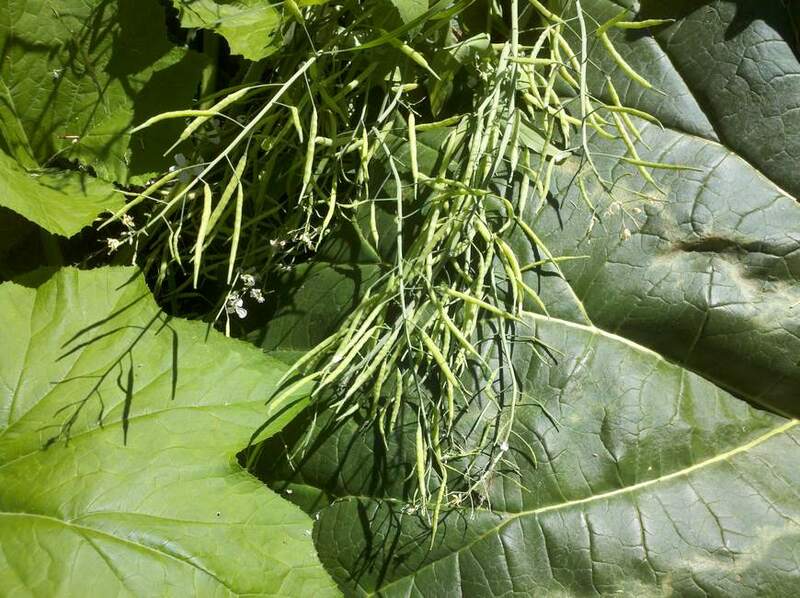 Brassicae are taking off, and dwarfing the peas. The potted peas that MJ got are doing well, but turning yellow at their base. Since it’s about eight plants in one small pot I’m not surprised. It’s a race between harvest (soon), and collapse. I planted three dow gauk bean seedlings this year. Two died (one in the KHG, the other in a pot) after not getting watered for about two days. I’ll try again. Those hops what survived being transplanted six weeks ago are doing well, and the big one is all the way up to the top of the concrete. Heres two pix, taken not quite 48hrs apart. *Fresh enough to knock a 3ft long half filled planter off the deck and down next the sliding door, where the dogs went mad defending us from this intruder. The weather this week was cool and rainy. Good for the lawn, OK for the garden. We are forecast to be in the 80’s by midweek, so I guess Summer is upon us. The garden continues apace. Bought some bok choy for the cabbage patch. Planted my asparagus rizhomes. Planted lots of corn, some of which the squirrels have dug up. Lettuce is starting to come in, and last year’s chard is still producing. Deb Tolman says it will bolt this year, so I need to plant a new batch. Hops are growing. Today or tomorrow I’ll have to get up on the roof and put in some hooks and wires for them to grow on. The KHG is doing a good job of keeping itself weed-free, but my main job these days is to keep down the weeds in the rest of the yard. The weather this week started out warm, then plunged, dropping 20F in six hours. The last five days had highs near 50 and lows below 40. I was worried about frost, but it never dropped below 37F, and all my tomatoes seem to have kept their flowers. The garden is looking pretty good right now. In, rooted, and ready to go. Everything is in (well, some corn to plant, and some strawberry rizhomes to bury), so it’s a matter of standing back while it grows. I have multiple tomatoes in the containers along the house. The hops have finally taken off. Four of the seven have made it. The last week I had protected them with plastic collars made from old water bottles. Partly in case of frost, but mostly to stabilize them from the wind, and give them a chance to attach to their grow sticks. Ah, this is more like it. The weather this week was cool, lows in the mid 40s, highs in the mid 60s, and rainy. After all, it is only May. The seeds I started weeks ago have finally sprouted. The miniatures I have planted in containers on the deck. 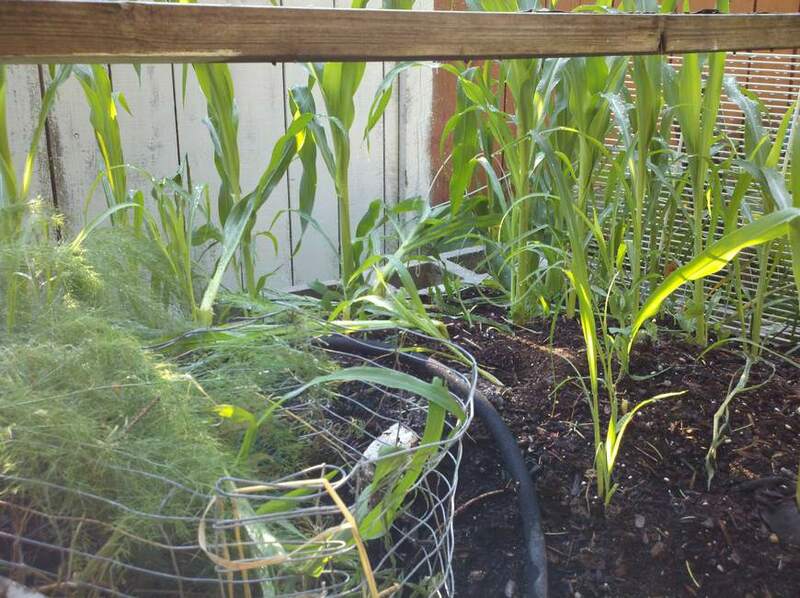 The corn I transplanted to Section 2 — and the squirrels promptly started digging them up. I need some help from James Bond’s old nemesis, SMERSHQ (Smert Shquirrlem). Tomatoes are settling in nicely, as tomatoes always do, bar frost, and the squash is mostly doing OK. My first tranch (trench, get it?) was looking good, but now seems a little peaked. The store bought plants are doing fine. My second tranch of homegrown has survived. I’ve got a few more squash coming up in the seedlingizer. I’m thinking of clearing some …. clearings … in the ground cover, and planting them there. I also have another 25 corn seeds what I just started inside. I’m bound and determined (did you know that doubling of statements like that comes from when England had just been occupied by the French, and the two languages were jostling side-by-side, as in cease and desist? ), bound and determined I say, to bring in at least one crop of corn this Summer. 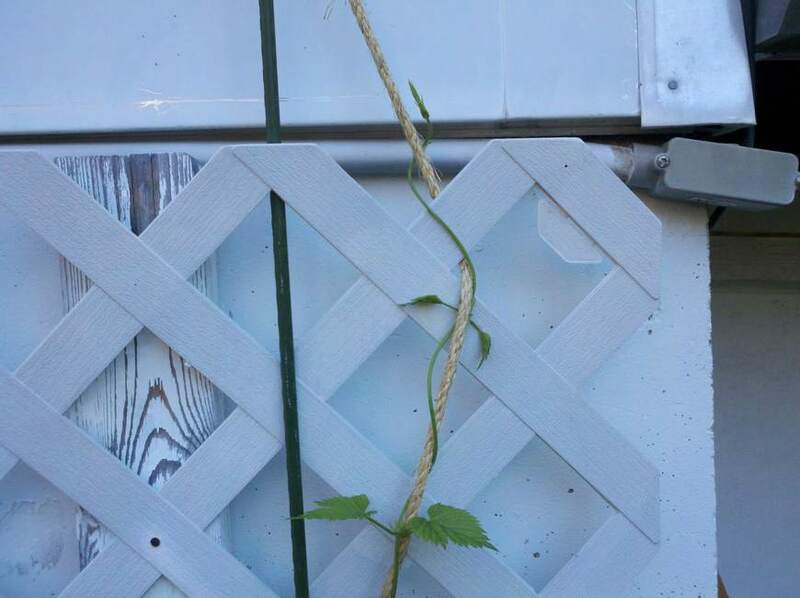 The hops are keeping on keeping on. No real change. I put some rougher sticks up for them to climb, and stuck a couple of plastic water bottles, trimmed top and bottom, over them, to help them hang on to their climbing stix and not be knocked around by the wind. Pix next week. PS: Happy Eliza Dolittle Day. The weather this week was hot and dry. Highs in the mid to upper 80’s (coming within a biscuit-toss of 90F on Saturday). Forecast is for cloudy/60s/showery for the coming week. The garden is pretty well set for the summer. Here’s what it looks like right now. Foreground is Section 1, which is all brassicae, except for I’ve direct seeded corn and some peas. 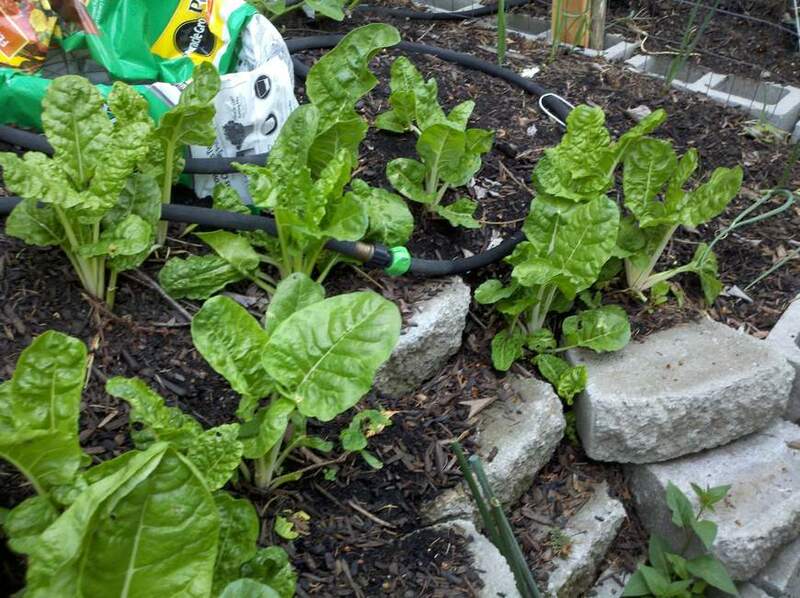 Section 2 is chard and lettuces — most of which haven’t come up yet. I also planted some beets there, on Sunday, and I’ll be planting corn seedlings there, as soon as I have any). Beyond the watering can is Section 3, tomatoes and squash, then Section 4, blueberries, strawberries, asparagus. Section 4 has chickenwire over it. The chickenwire and plastic frost covers are hanging on the fence at the far end. Planted one of the Husky Gold cherry tomatoes into a hanging basket. Was going to plant a Hillbilly in the other one, until I looked it up and found the fruit ranged to a pound or more. The hardware store got a new shipment of squash in, so I have two yellow squash and two acorn squash planted in Section 3 of the KHG. I thought I was picking up zucchini, but I grabbed two pumpkins, instead. I put one in the ground next the Unkillable Rhubarb, and one in a pot under the sakura. MJ was out on a shopping sweep of the Airway Heights area, and came back with a bunch of peas in a pot, plus an S-100 cherry tomato for my other hanging basket, a Celebrity (Beefsteak size, determinate), and a strawberry hanging planter. Put the S-100 in the hanger, the Celebrity in a pot, and started on the strawberries. The box had a cheap green plastic bag with holes, and a bag of dirt. Inside the dirt was a rubberbanded clump of strawberry roots. Instructions were to fill the bag with dirt, plant the strawberries with the roots buried and the heads showing, lay it on its side, and keep it wet for two weeks. The heads were small and kept breaking off. The dirt didn’t begin to fill the bag. We shall see. Meanwhile, the hops are pretty much unchanged. One has grown a couple inches. One may have grown. One hasn’t grown and is having trouble hanging to the stake. Two are an inch tall and look healthy. Two have fallen over and look brown at the dirtline. I covered those two over, hoping they’d put down new roots. My attempts to start my own seeds are having mediocre success. Admittedly, half the seed is last years. Old seed: 16 corn, 4 sprouted. 20 squash, none sprouted. 10 peas, none sprouted. 7 miniatures (2 squash, watermelon, pumpkin, 2 cucumbers), 2 just sprouted. New seed: 20 corn, 20 squash, 5 peas. Too soon to tell. Also direct seeded about 20 corn in Section 1. About half of them companion planted with Dow Gauk seed from last year. Now that the danger of frost is past, I’m having to store those 4x8ft plastic and chickenwire covers. I’ve draped them over the back fence. My neighbor on that side never goes into the yard, except to cut back the weeds every couple of weeks. Speaking of frost, last winter we had highs below freezing for much of December and January, and in mid-January we had a week where the lows averaged about 10F. Fortunately, we had a heavy snow-pack as well, and a surprising amount of chard survived the winter and are now ready for eating. The weather this week was finally warm enough to take the frost covers off. The forecast for the coming week is highs in the upper 70’s low 80’s, lows around 50. A surprising amount of chard survived the winter, and we are starting to have some of that in our salads. Went down and bought a bunch of tomato plants — 8″ high Better Bush (2), Beefsteak (2), and Early Girl (2); flats of 3″ high Hillbilly and Husky Gold. Put most of them into Section 3, with a few held out for deck plants. On deck I also planted one each of the Abe Lincoln and the Oregon Spring. There was only one of each that looked like they’d live. Also planted three summer squash seedlings that looked survivable, into Section 3. They are expecting a new shipment of squash on Monday, so I’ll likely buy some more then. I started 20 of last year’s corn seeds, but only four sprouted. Started 16 pea seeds, but none have sprouted yet. This year is turning out to be a bad one for home-seeded plants. Trying again with leftover seed from last year’s miniature plants: dwarf watermelon, melon, squash, and cucumber. I’ve got space for 25 new seedlings, but I’m not sure what I want to plant. Four each of six things, I guess. Counter-squirrel ops seem to have worked. Last week I planted ten strawberry plants, and the next day one had been dug up and one had been chewed off at the dirtline. I draped two of the frost panels over them, and covered the ends with wire fence (2×4″mesh). 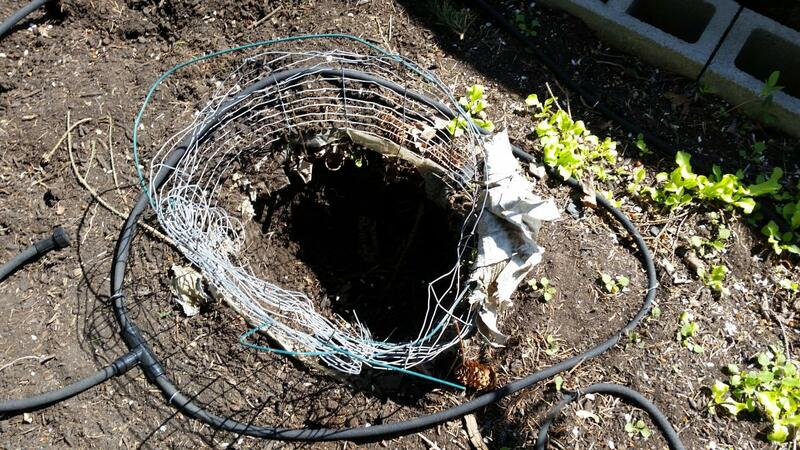 The fencing probably won’t keep out a determined rodent, but it seems to have discouraged them for now. 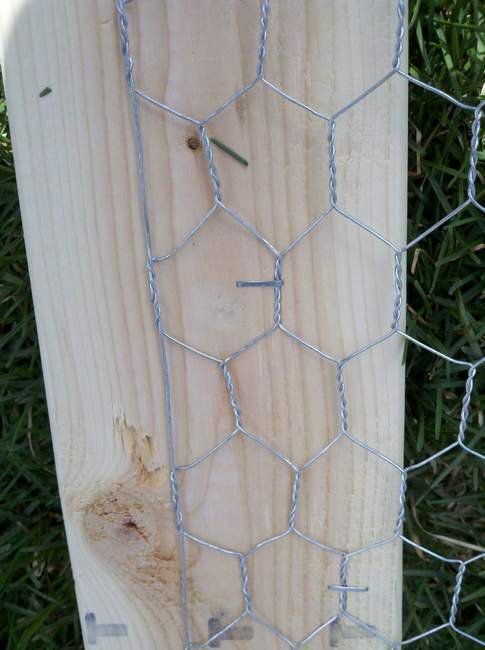 I’m working on some straight chicken-wire panels to use in place of the frost covers. Same design. The hops are surviving but not thriving. One has started to grow. The other six look OK, but are no bigger than they were last week. The weather this week finally warmed up, with no frost predicted. So I went mad in the garden. On Thursday (which is a break day for me, after night class), I went out and spent a chunk of money on plants: three blueberry bushes, ten strawberry plants, seven asparagus plants (oops, I already had six dried rhizomes at home. oh well). Spent the morning getting them into Section 4 of the KHG. That’s the one I’m reserving for perennials. 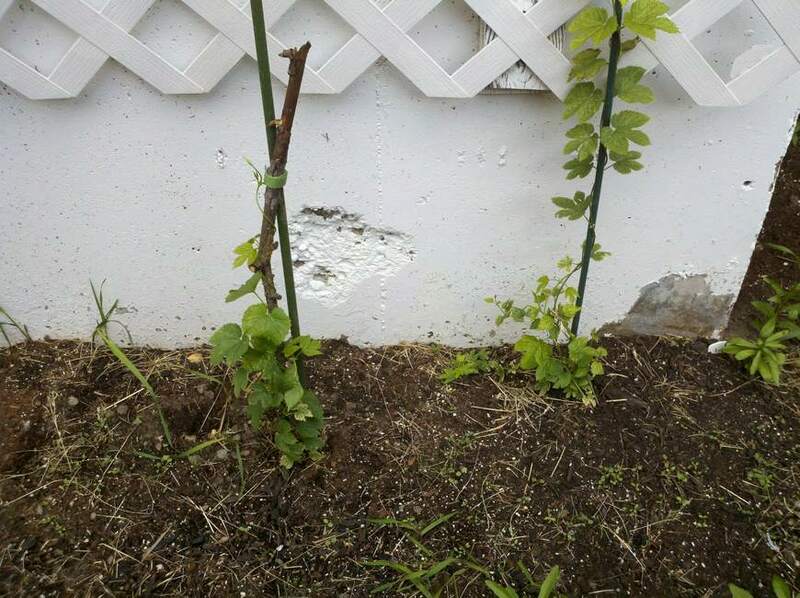 Also planted my hops plants along the south wall. One was a foot high. The others were about four inches. If reports are correct, they’ll be over the roof, this time next week. Friday, the madness continued. After dinner I ran down to our local hardware store and bought a bunch of plants — white cabbage, red cabbage, cauliflower. The stuff I’ve started isn’t doing anything to indicate it has a well-developed will to live. Spent the remaining hours of daylight planting them in Section 1, which is brassicaville this year. As of Sunday, everything is in, and most things are under cover — Section 4 excepted. High winds Sunday night, higher winds for Monday, at which point we get one night more of wind and two nights of frost. My plan is to put up the cover for Section 3 as soon as the wind allows, maybe Thursday, and then try some early tomatoes. That gets them in a month early, and if I use store-bought plants, it gives them an additional eight weeks. None of my home-sprouted seedlings are worth bothering with. Will also plant some squash. That’s the plan. The weather this week has been nice, in an autumnal, great-weather-for-football kind of way. Next week will be the same. Unfortunately, that’s meant lots of mild frosts. Midweek it is due to warm up, and that’s when I start planting in earnest. The coldframe covers are helping, but not a lot. Soil temps seem to be running around 50F, against air temps that haven’t topped 45 or 47 all week (and that have bounced around freezing at night). Nothing that I’ve set out has died, but not a lot has come up. I think I’ll be buying a bunch of plants this year. Got one more section hosed this weekend. Used up the last of my 1/2″ drip hose and have moved on to the 5/8″ stuff. Had to use a hose clamp to fit the bigger hose on the littler adapter. Tuesday is when I build a frame on Section 3 and start prepping for the tomatoes and squash. Speaking of which, the tomato seedlings are still only about an inch high. The squash is closer to three inches, with four true leaves each, but on a couple of them the bottom two real leaves have turned yellow. No idea. I dug up my hops the day after I planted them in their temporary containers, and replanted them with just the tip of the green part showing. Previously, they’d been covered. Seems to have worked. The big one is a foot high, and the six little ones are about three inches each. Wednesday is the first unfrozen night, but I”m in night class, so I’ll plant them out on Thursday. I’m wondering how they’d grow on the deck itself, in containers (one each) to provide shade to the south. Running a little late on this, just like with all my other gardening chores. The weather this week was cool to cold. I spent the weekend setting up a cold frame around two of the KHG sections, and seeing if I could kill my seedlings by failing to water them. My first attempt at a cold frame ended in failure, as I reported last week. This week’s experiment went much better, given that we haven’t had any wind yet to test it. My cunning plan was to build a simple 2×4 ridgepole over each section of the KHG, and drape the plastic/chicken wire over that. The object of the exercise is to keep in heat, and keep out squirrels. I decided to do this by making a sandwich. Then I got to work on the cold frame. 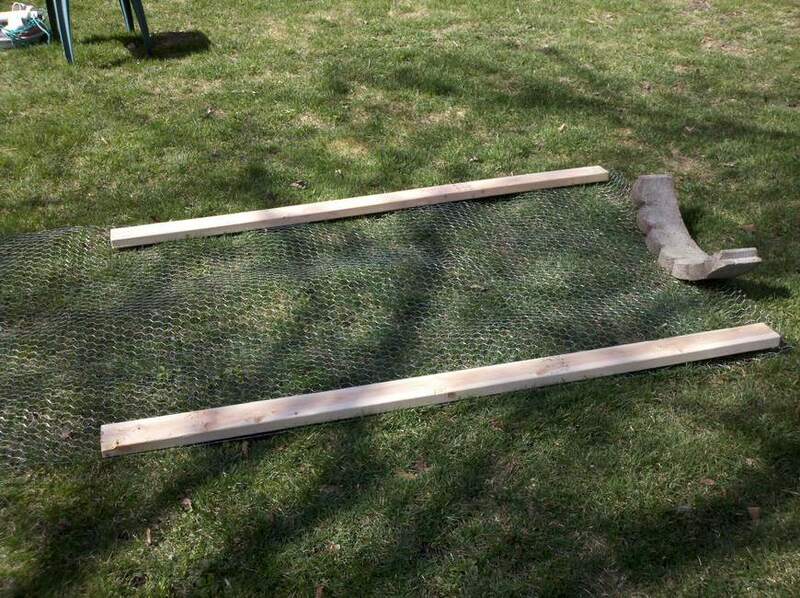 Lay out the chickenwire, and two boards, long enough to run the length of the KHG (remember, mine is rectangular). The weather this week was threatening rain and unseasonably warm (50s), what the local weather mavens call a pineapple express, followed by very windy and cold. I broadcast many of last year’s seeds into an area of ground cover that I dug over. We’ll see what grows. Midweek the soil temperatures were in the 40’s. The one KHG section that had clear plastic over it was up to 47. I have found that a 10ft length of thin walled PVC tubing will arc nicely from one side of the KHG to the other. The problem is, I need to have a ridgepole for it, because I need to drape things. Tried cutting the tubing in half and sticking in a + shaped connecter. Glued it good, let it dry overnight. Did four of them. Three of them broke when I tried to curve them. I guess the problem is that the connecter is sitting at the point of max curvature. Another problem was that the base of the PVC wants to push the cinder block out from the wall. I am rethinking my approach. Currently, I’m favoring a simple set of T posts with a ridgepole across them. The chicken wire/plastic sheet would be tacked to two boards and simply draped over the ridgepole. Like a pup-tent. Still thinking about it. Spring, such as it is, has come to the NENW. The weather was in the 50’s this weekend, and the last most of last Thanksgiving’s snow has melted. The ground has thawed to a depth of perhaps two inches (at least, that’s how far the pick goes in before it bounces). Still not transplant conditions. Using my Gantt chart as a guide, I started my early brassicae indoors a couple weeks ago. The seedlings are approaching 2″ now. If I can find time, I’ll start some more seeds on the warm tray this evening. I’ve started the spring cleanup around the garden. It’s amazing how much trash the snow hides. 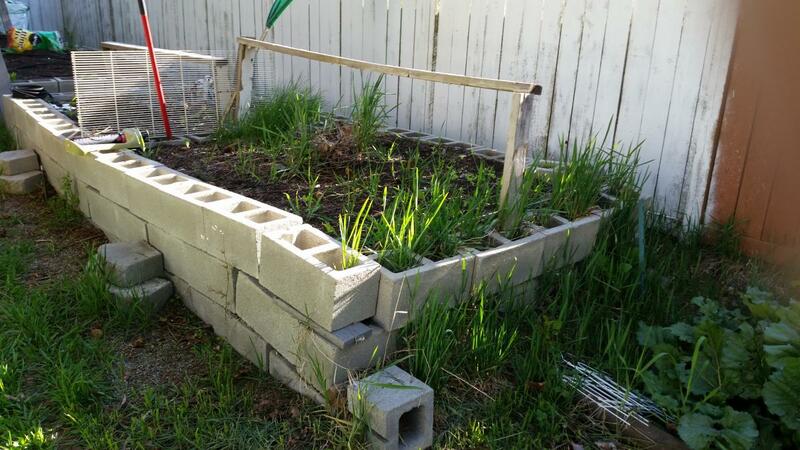 Also started repairs on my compost cage. Plastic cable ties are not quite the thing for making it through a cold winter, so it’s trying to disassemble itself. As I roll it over I’m replacing the plastic with steel hose clamps. The ends are also coming out, and I’m not sure what I’m going to do about those. One lesson I’ve learned is that you don’t want to fill a 6x4x4 container full. I can roll it over, but I feel it the next day. I’m working on a cold-frame/mini-greenhouse for the KHG. A ten foot length of 3/4″ thin walled PVC will nicely arc from one side to the other, with length to spare for stuffing into the cinderblock. I plan to drape chickenwire over the top, and then plastic sheeting on top of that. Or something. 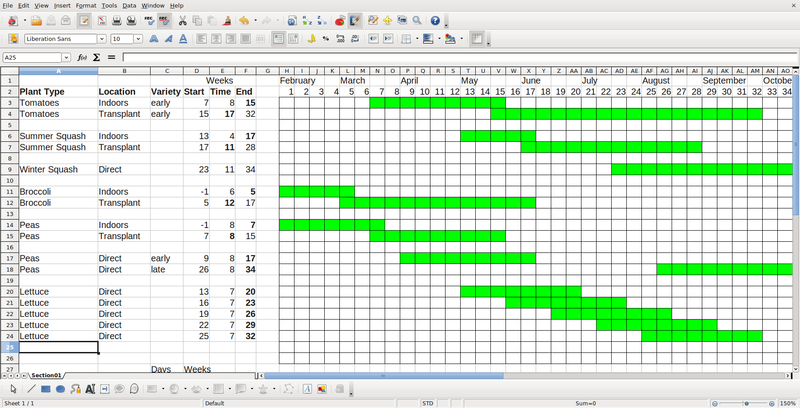 A Gantt chart is a tool for project management, developed by Henry Gantt back near the turn of the last century. It’s a horizontal bar chart that shows start/stop dates for various parts of a project. In order to help plan my garden, I’ve developed a Gantt chart of my own. You enter the start date and duration, and it displays that information using a horizontal bar on the calendar. Here’s the file. It’s in .xls format because WordPress won’t allow .ods (but it will allow .odt, go figure). There’s two steps to building the chart. Step 1. Write the formulas to define the status of the calendar cells. Step 2. Define the cell formatting, based on that status. In Step 2, you format the cell with the formula so that it shows up white if it’s value is zero, and some other color, say green, if the value is one. That’s a two step process itself. Step 2.1 is to go to menu item Format/Styles and Formatting and define two new format styles, let’s call them GanttON and GanttOFF. In the first one the cell background and font color are both green. In the second one they are both white. Changing the font color makes the numbers invisible. Step 2.2 is to tie the style to the cell value. You do that using the Format/Conditional Formatting menu choice. For cells with a value of 1, set the contitional formatting to GanttON. For cells with a value of zero, set the contitional formatting to GanttOFF. Now we tweak the Start/Time/End cells. Keep in mind that there are two basic approaches to planting — direct seed, and transplanting of seedlings started earlier. Direct seed is simple. It uses one row. If you are planting in the Spring and want to know the harvest date, then you enter the Start date (say, date of last frost), and growing Time. The harvest (End) is determined by these two numbers: End = Start + Time. If you are planting for a Fall harvest and want it ready before a certain date, then you use Start = End – Time. For transplants, you need two rows. The first row is to time the seedling growth up to some specific transplant (End) date, so Start = End – Time. The second row is time from transplant to harvest, so End = Start (transplant) + Time. To tie the two together, you make the Start of the outdoor growth equal to the End of the transplant growth. This will be the last Garden Report for 2012. It’s more of a tidying-up, because the garden has been pretty well frozen since the beginning of the month. On the 5th of December, we ate the last of the homegrown tomatoes. These were ones that were harvested green and left to ripen on the living room floor. We had probably five pounds left, but not all were salad-worthy. A few were beyond help, most were destined for the tomatosauce pan that day, and the ones that were not too soft or wrinkled went into the chard and lettuce salad . Also on the 5th, I pulled up the last of the carrots (we finished those yesterday), the last few frost-blasted chard leaves, and the green onions. These were interesting. They were not intended to be ‘green’ onions. In fact, some of them were leeks. But I had planted them late (they were in Section 3 of the KHG), and the dull weather kept them from developing properly. So I had about a pound of mixed scallions (including a nice purple Italian variety). We’re still using them. They’re a little hot because of their size, but still good. I have a whole box of unused seeds. One website says that if you have seeds that have gone past their plant-by date, just clear a patch of disused ground the next Spring and throw them all in and see what comes up. I might try that with the herbs and the greens, but not with the squash and corn. We had 4″ of snow overnight, and it looks like we’ll be bouncing along right at freezing for the rest of the year (which means there’s a reasonable chance that this snow will still be here on President’s Day), so I don’t expect any garden activity until February, when the seed-ordering takes place. In the meantime:Merry Christmas, Happy New Year, and for Setsubun: !鬼は外! 福は内! 1. Don’t oversquash. I had half of each of two sections in squash, and then I had two whole sections in squash, and then I had part of my backyard in squash. The only thing that could compete was the tomatoes. 2. Don’t plant anything but tomatoes alongside squash. The greens were overwhelmed, the onions stagnated, the blueberries died, the dill died. The beans barely survived. The gardening season is winding down, and this will be the last regular report of the season. I’ll wrap it up with a lessons learned later in the week. If the forecast holds, we will have had 84 consecutive hours of temperatures at or below freezing since last Thursday afternoon, with a low of 20F. The light dusting of snow that came with the temperature drop stayed on the ground, and even on some of the trees, until it was covered up by 3″ 5″of snow Sunday night and Monday. It’s going to warm up in the coming week, but only to the point that the freezingness only comes at night. 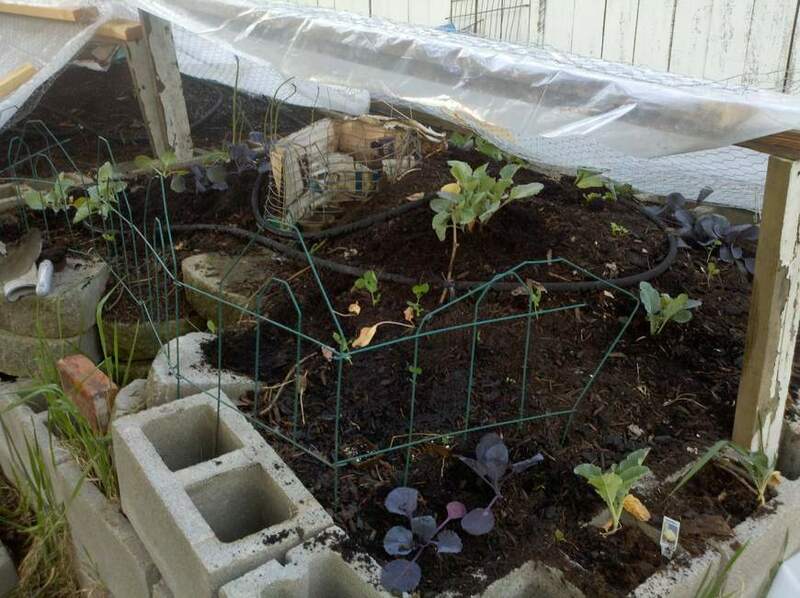 I’ve covered the peas with clear plastic, but the carrots and onions and chard (oh, my), are not protected. The chard we brought in last night was crunchy. We are working our way through the tomatoes, but have lost a little ground. I’ve made two batches of tomato sauce, and have been eating about a pound a day for lunch. We’re down to two flats of ripeners, and three decorative kitchen wire baskets of ripes. We’re going to have to step up the giving-away part. Right before the big frost hit I mounded some of the extra Cheney Civic Compost onto sections 1 and 2. The squirrels immediately dug in, and now it looks like a WWI battlefield. I’d like to think they did it in honor of Armistice Day.